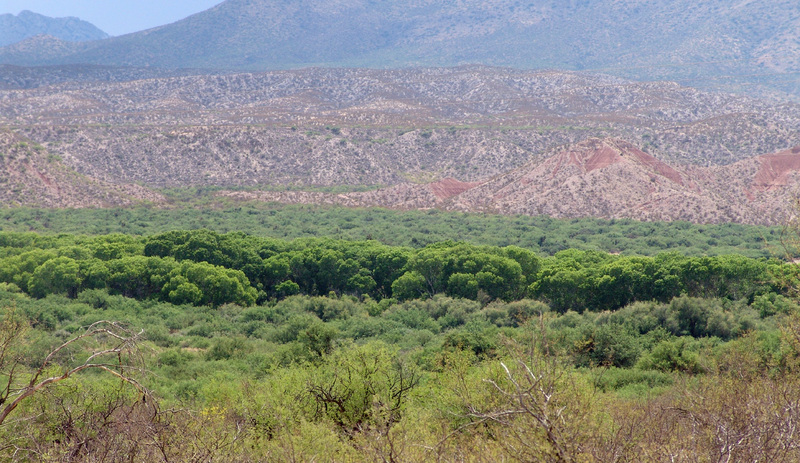 Above: San Pedro River gallery forest, viewed from lower Soza Mesa near Cascabel, Arizona. 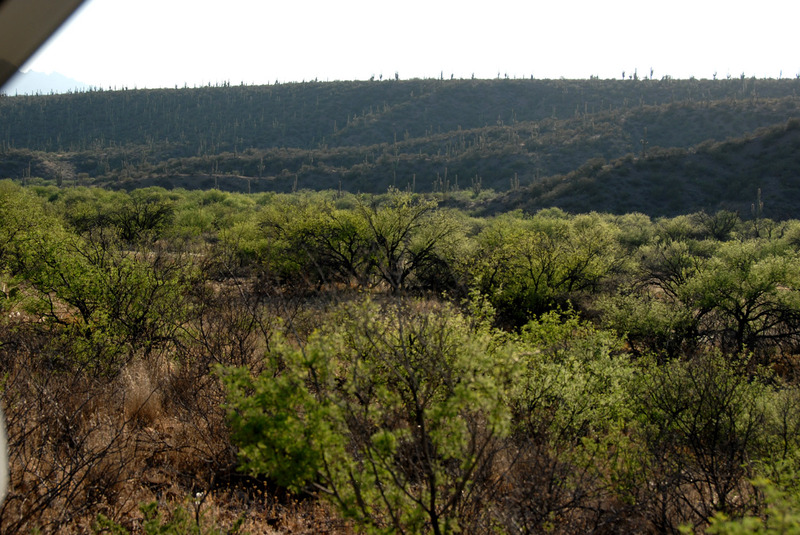 Cottonwoods and willows are just leafing out in March 2003 (in the foreground, paloverde- and creosotebush-covered slopes, with scattered Saguaro cacti in the mid-distance). 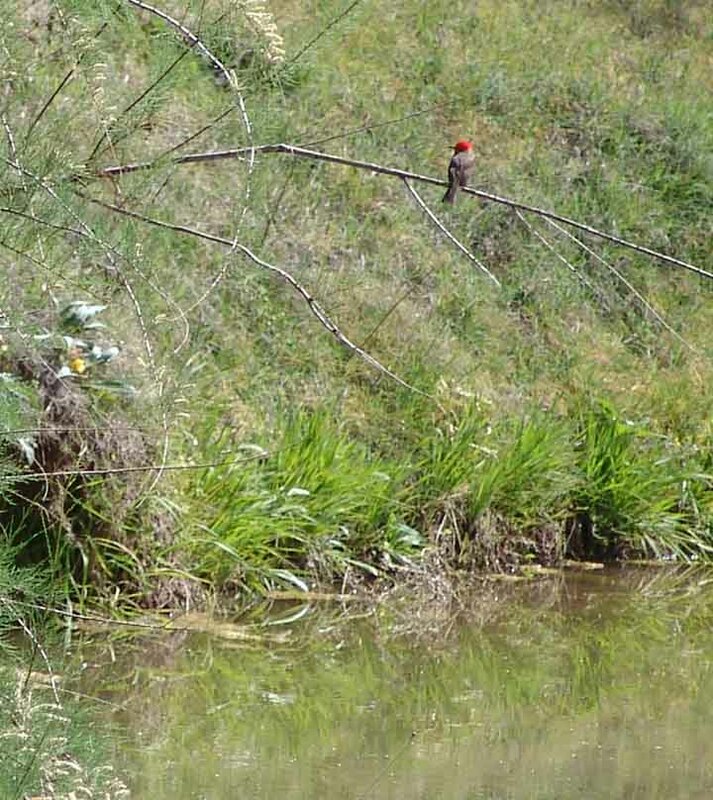 "The riparian ecosystem along the unregulated San Pedro River is one of the most valuable in the Southwest, particularly for birds. " Robert Webb, Stanley Leake, & Raymond Turner 2007, The Ribbon of Green, Tucson: University of Arizona Press, p.223. 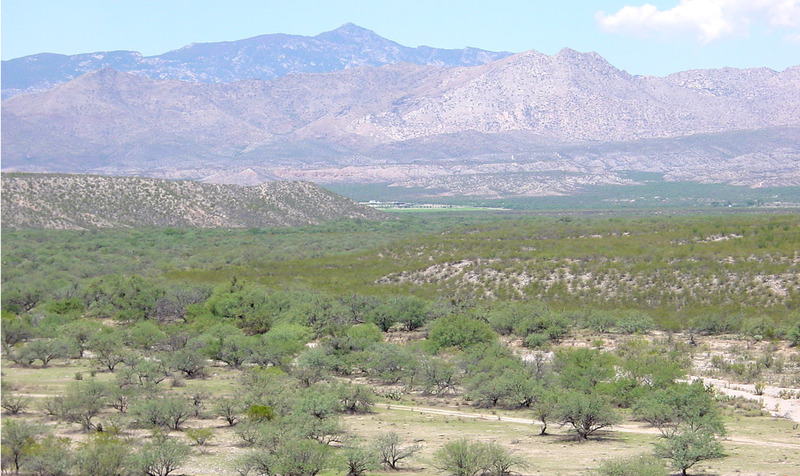 The San Pedro River valley is the most significant migratory flyway remaining in the Southwest. Nearly 400 species spend part of their life-cycles along the San Pedro, and during peak migration, between 1 and 4 million birds are found there. Part of the Madrean Sky Island Archipelago, the entire valley's exceptional species richness has complex causes, but for birds it provides a well-watered, verdant corridor running from southern tropics toward northern tundra (and back), with stacks of diverse and accessible vegetation resources (for birds, anyway) rising up alongside it in the form of "Sky Islands" all the way to its confluence with the Gila River. For further details of the (unfortunately, fragile) ecological bases of this richness, see below. 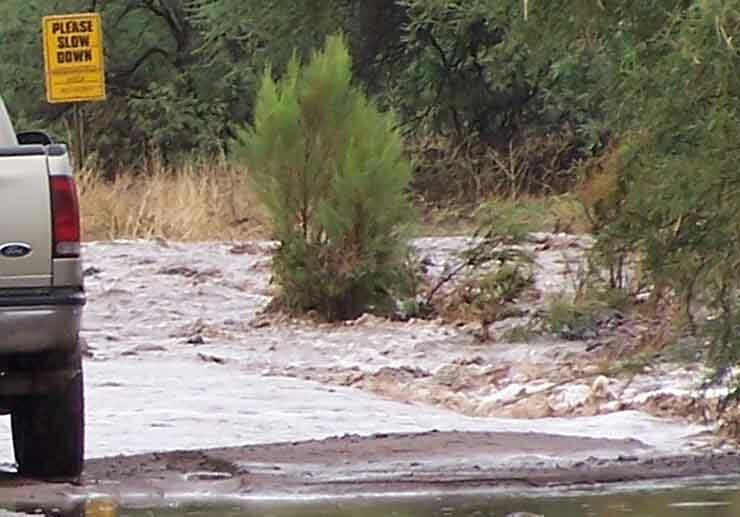 Below: the flooding San Pedro River at Cascabel, Arizona in August 2005. 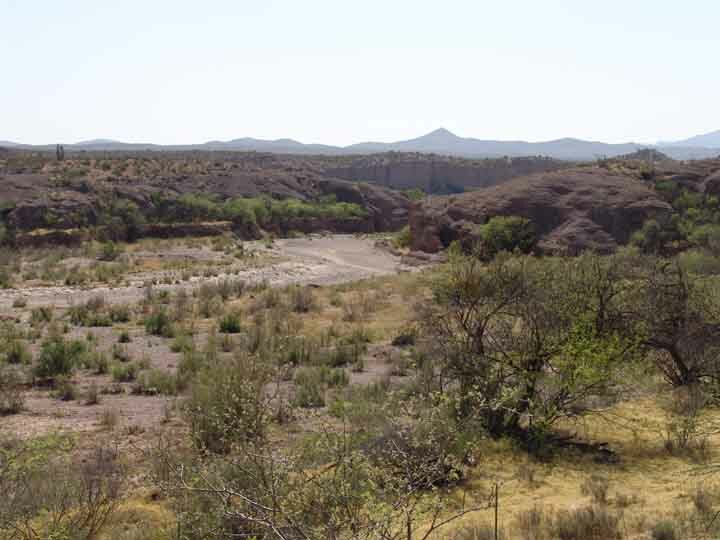 The San Pedro River begins in Mexico (some 30 miles south of the border in the Sierra Manzanal Mountains, not far from the city of Cananea in northern Sonora) and ends at its confluence with the Gila River near Winkelman, Arizona. A south-to-north-running river, it form a central corridor of the Madrean Archipelago, the complex of "Sky Islands" scattered from the Sierra Madre of Mexico to the Mogollon Rim in Arizona. A series of fault-block episodes occurred, as the valley was incrementally enlarged, became deeper and, even as this trough was dropping, it was filled with erosion deposits from the fault-block mountains that flanked it (which rose as "horsts" or uplifted blocks while the trough or "graben" dropped). (See our Geology pages for further discussion.) The first point here is that what we see today as we go downstream in today's valley are flanking ranges of mountains located mostly well back from the riverbed on both sides, their long axes roughly parallel to the valley trough and their strata usually tilted away from the river, and very long "bajadas", or alluvial fans, that run out from the mountains toward the river. Today these bajadas form high terraces near the river, which has downcut through them during the past several million years. 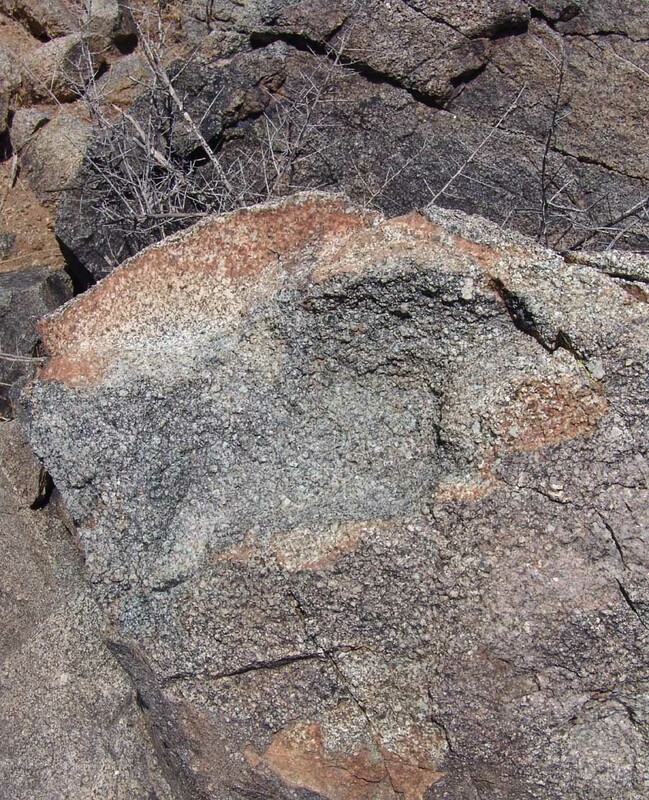 Note also: for a deeper and broader view of the geology of this area, see Cochise College Geology of SE Arizona. Second: note the scattered distribution of silt and clay in basin fill, which affects how deeply the watertable sinks along the river, and thus (in our desert conditions) whether water will be present on the surface of the floodplain at a given location during dry spells -- a significant feature for wildlife. The map below divides the watershed into two parts marked roughly by the city of Benson. South of Benson the sky islands are more distant from the river and the bajada terraces are broader. North of Benson the width of the valley constricts and the bajada terraces are narrower. the Lower San Pedro (from Redington Bridge to the confluence with the Gila River). While our interests in this website include the entire watershed, our particular knowledge focuses our attention mainly on the Middle San Pedro, and we will focus our discussion and illustrations mainly on that area. We will however say something about the others and provide links to sources that concern both the Upper and Lower San Pedro Watershed Areas. 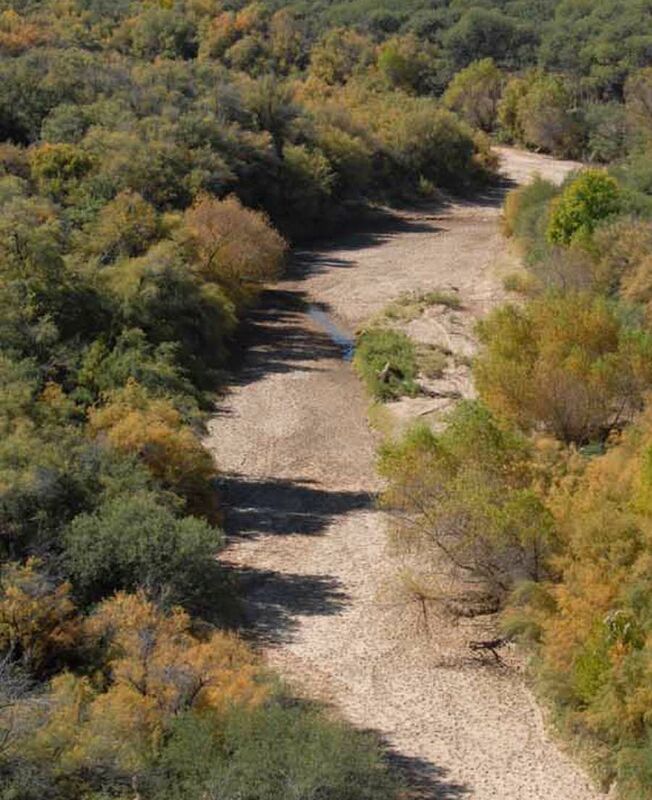 According to Webb, Leake, & Turner (2007, The Ribbon of Green, Tucson: UofA Press, p. 223), "Riparian vegetation has generally increased along the [San Pedro] river north of the U.S.-Mexico border.... [and] closely follows the alternating pattern of perennial-ephemeral flow that characterizes this watercourse along its greater than 150-mile length in Arizona " Moreover, "...the case of riparian vegetation change on the San Pedro River represents one of the largest increases in woody riparian vegetation in the Southwest. Many researchers have noted that this river, once swampy, now sustains a verdant forest." 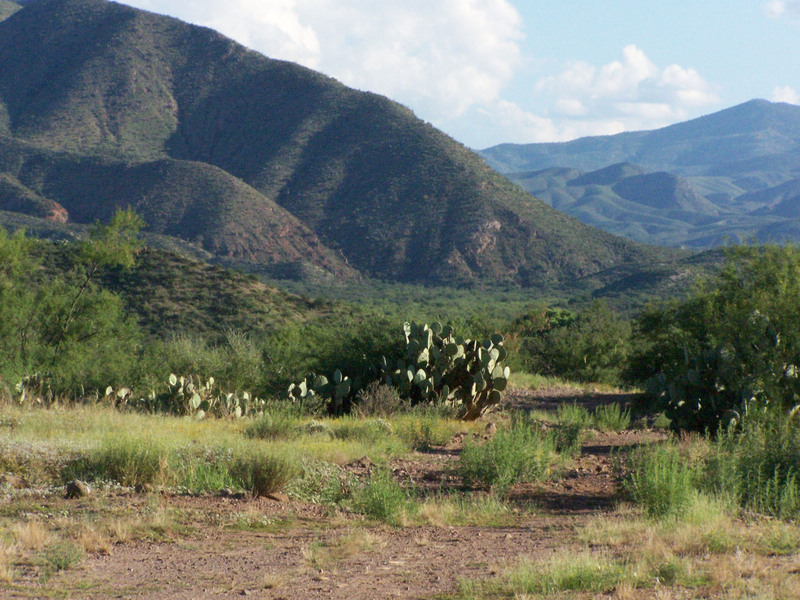 In this part of the drainage, the immediate flanking Sky Islands are the Huachuca Mountains (much of which is National Forest) and the Mule Mountains. While we cannot pretend to detailed understanding of the Upper San Pedro Watershed (see below for links directing viewers to some relevant sources), we do intend to explore ecological relationships between the river corridor here and its main flanking Sky Islands. 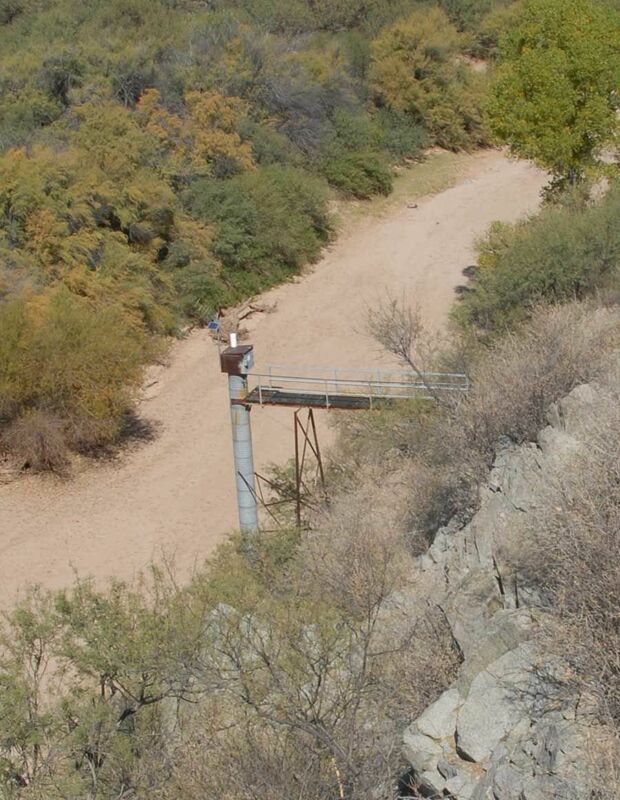 Toward developing that aim, see this link: Huachuca Mountains (and for the vegetation-stacking features of Sky Islands, see that link). Part of this Upper (southern) area of the river was designated The San Pedro Riparian National Conservation Area (SPRNCA) in 1988. The SPRNCA straddles the northern end of the Sierra Vista Subarea and the southern end of the Benson Subarea. 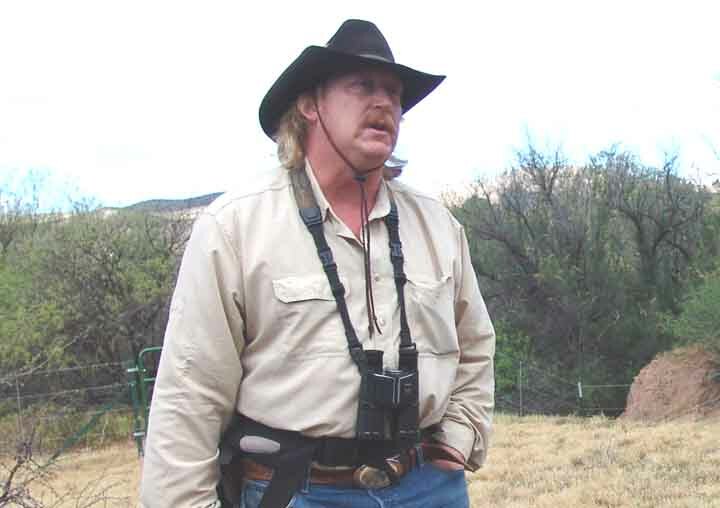 For some details on bird conservation activities in this part of the river valley, see this link: Southeastern Arizona Bird Observatory (SABO). For an excellent overview of the many agencies concerned with the area, see this link: Upper San Pedro Partnership (USPP). See also Friends of the San Pedro (FSPR), a non-profit organization that supports the work of the SPRNCA. While the entire stretch of the river contains numerous historical and archaeological sites, this southern portion is internationally known for its Paleoindian sites dating to the end of the Pleistocene Epoch. See Clovis and Murray Springs for a few details. The plants and animals living here during late Pleistocene times were very different from those present today, as suggested by this image below. See Pleistocene Megafauna extinctions, and The Clovis/Folsom Transition. 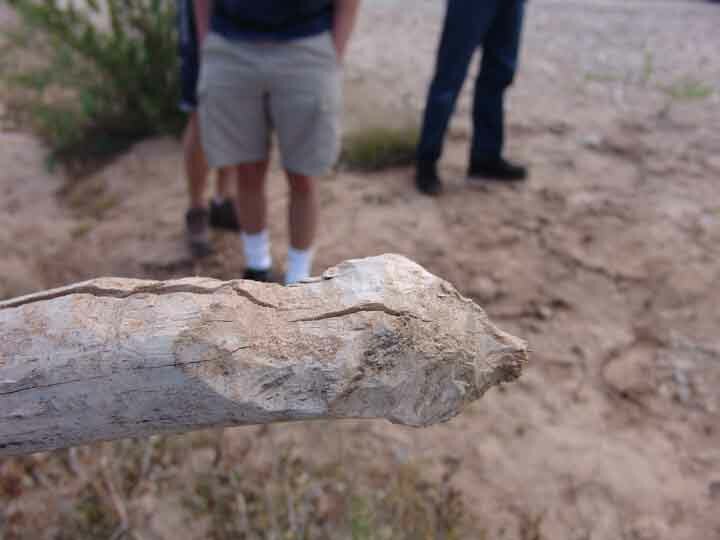 For a general outline of the archaeological history of the river, see Archaeology of the San Pedro Valley. In this part of the drainage, the main flanking Sky Islands are the Whetstone Mountains and the Dragoon Mountains (both of which are mostly National Forest land). 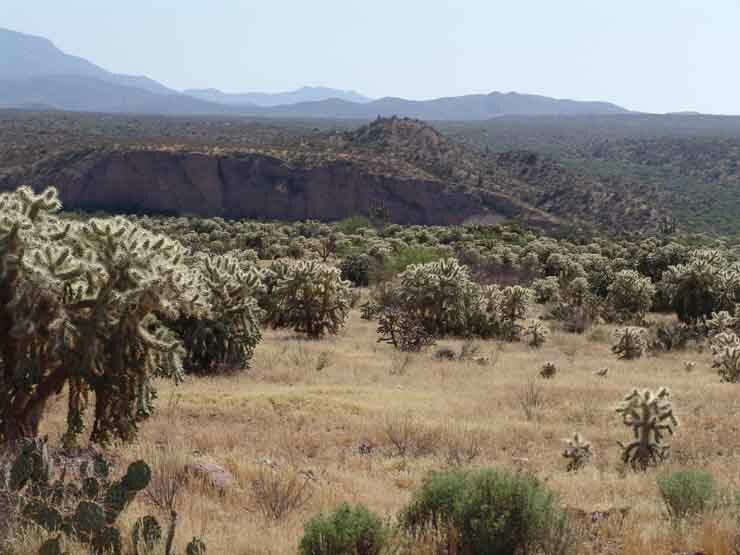 The Little Dragoon Mountains lie mainly to the north of the I-10 freeway. As you can see on the map, two substantial paved highways, AZ State 90 and US 89, run north-south paralleling the river corridor on each side. These are both high-speed motorways and therefore constitute significant barriers to between-mountain movements by terrestrial vertebrates. 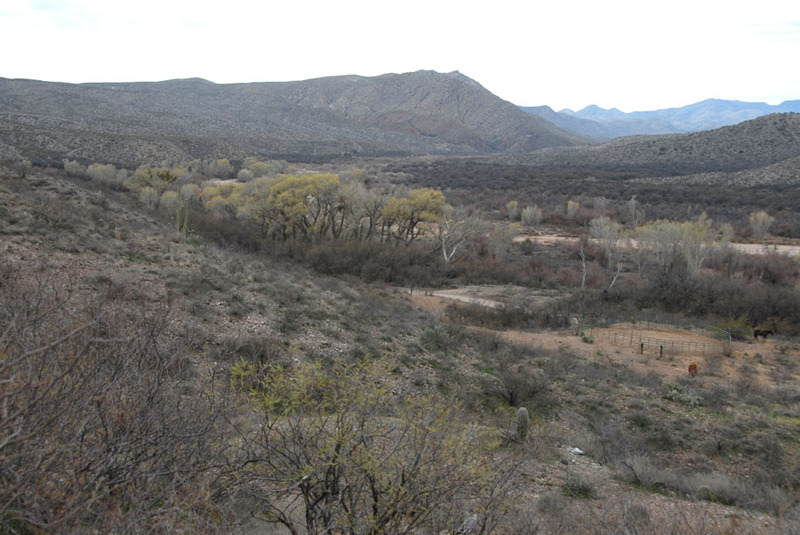 Below: looking southeastward toward the Mule Mountains (and the location of Bisbee) from near Fairbank, Arizona: gallery forest of the Babocomari Stream drainage in the foreground, running from lower right to middle-left; San Pedro River Cottonwoods et al. in the farther distance, both rivers running from right to left. 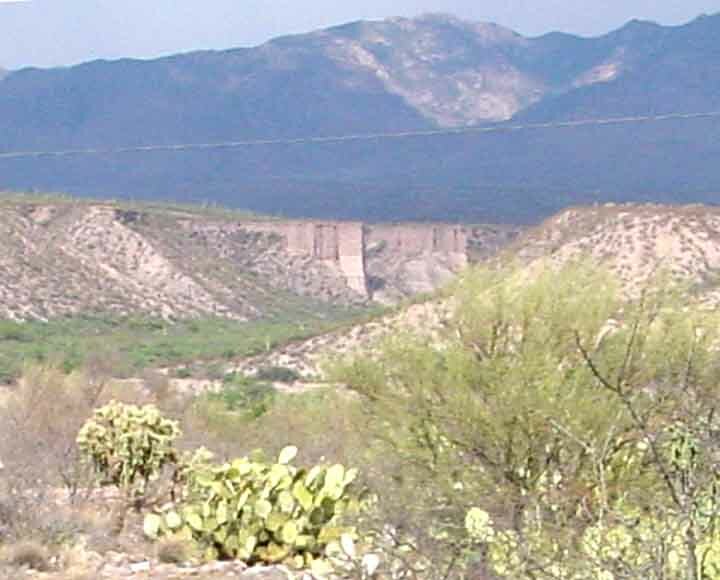 (July 2002) This image, which looks from the southern edge of the Middle San Pedro out into the northern portion of the Upper San Pedro, illustrates the very broad width of the valley south of Benson. Note the faint adobe mounds marking the ruins of the "captain's quarters" in the middle distance. Below, a copy of the map of the fort prepared by Charles Di Peso, the archaeologist who originally surveyed and dug portions of the site in 1950. 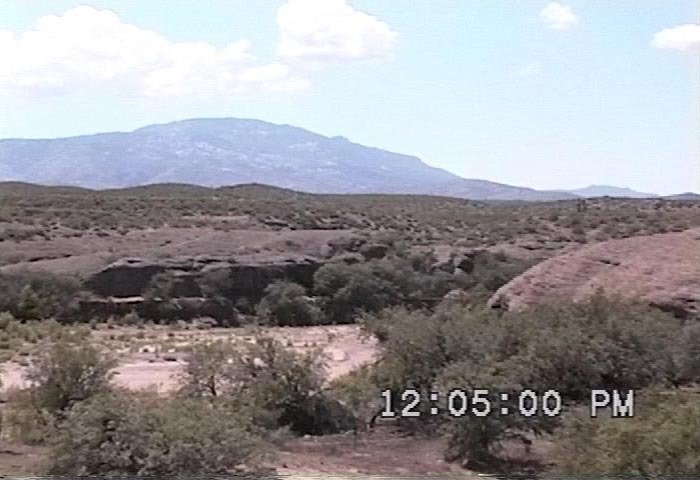 The picture above was taken from Kartchner Caverns State Park April 17, 2005, looking from the other side of the bajada toward the southwest, where the escarpment tilts down from its apex toward the west. Note the close grass cover in the foreground, part of the Apache Highlands Grasslands. 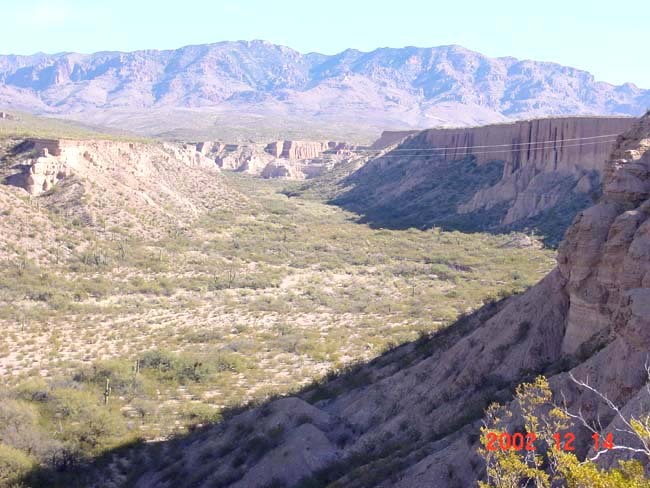 An informative video presentation of the geological and hydrological history of this part of the San Pedro River Valley may be viewed at this link: Kartchner Caverns Hydrology. And see Whetstone Mountains for more details on this, a lesser (but by no means insignificant) Island in the San Pedro Valley portion of the Madrean Sky Island Archipelago. See the link just listed for more details on Island-Corridor relations here. 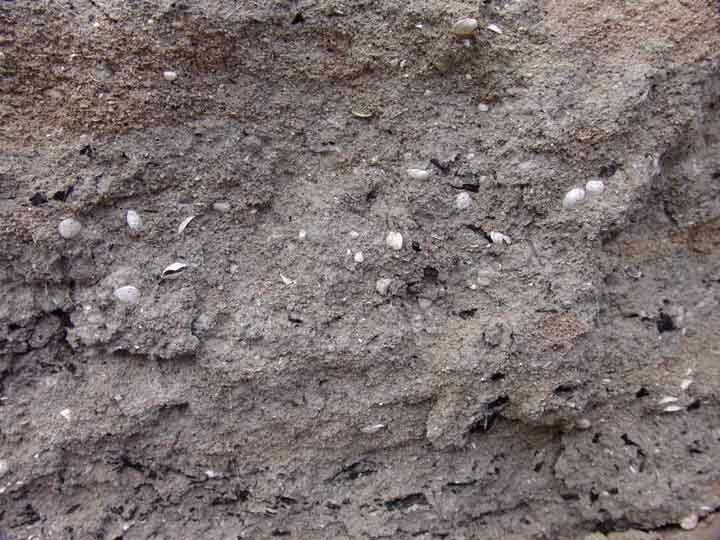 The sediments originally deposited in this very extensive lakebed consist of as much as 900 feet of clays, silts, and freshwater limestone (see the "silt and clay" layers in the cross-section dispayed in the USGS diagram further above), and they tend to confine the vertical movement of ground water in the basin, creating aquifer conditions that sustain the distinctive artesian wells found near the town of St. David. (See Thomas Blakemore, above and cited in Geology Credits.) These have of course proved advantageous to farmers here, who settled the area since prior to the 1880s. The city of Benson lies on the western edge of the river, and forms the main vehicular intersection of the area. The map below shows Interstate Highway 10 running east-west past the city, dropping from an Apache Highlands Grassland terrace elevation of more than 4160 feet to the west down to 3500 feet at the river crossing. The highway then rises in altitude toward the east, reaching 5,000 feet elevation at the Texas Canyon summit. The largest city in the Middle San Pedro Watershed (with a population of ca. 4900 in 2005), Benson was established in 1880 when the Southern Pacific Railway made its San Pedro River crossing (the city name is that of a friend of the Railway's President at the time). Its numbers might well increase to more than 50,000 by 2025. San Pedro River groundwater is its primary source of water and hence anticipated increases in groundwater pumping will soon threaten quality of life around here (including riparian habitat). Sources of decline in streamflow of the San Pedro River here also include changes in upland land-cover and riparian vegetation. Quality of water remains good for domestic, governmental, and commercial uses (though there a 9-square mile area of contaminated ground water just SW of St. David (now designated as an EPA Superfund site). [See Blakemore cited above]. As in the St. David area, the basin fill around Pomerene contains clay deposits from the ancient lake, so artesian wells are found here too, and these are much used by local farmers. 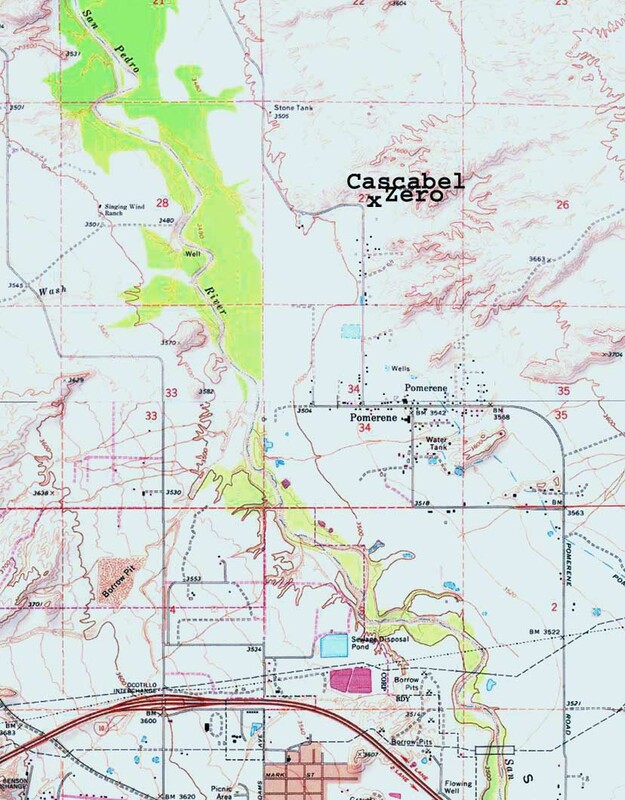 On the map below, the black arrow at the top indicates the location of the Cascabel Road, the main roadway down the river valley, which stays on the east side of the river all the way north past Redington. (Another road follows the west bank, but it ends well south of Cascabel.) 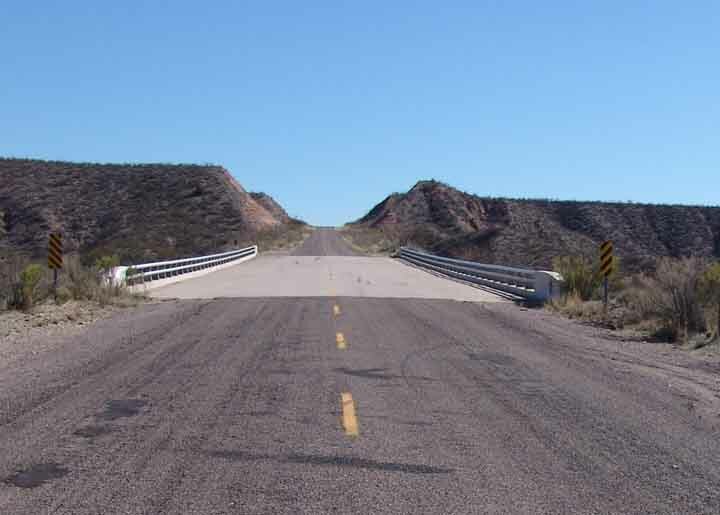 The Pomerene Road becomes the Cascabel Road about 5 miles north of the I-10 exit. We hope to insert more history of Pomerene into this space as becomes feasible, and would of course welcome Pomerenians to contribute credited essays to it. The constriction of the valley may be seen at this point, where the terraces on the east side of the river reach down close to those on the west. Beyond the far lower end of the mid-left terrace, you can see a short horizontal strip of pale green, marking irrigated farmlands and buildings located on the San Pedro River floodplain. 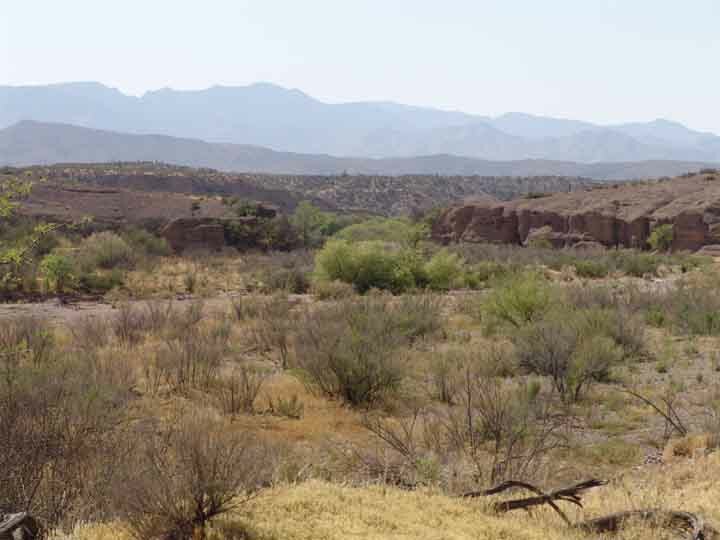 (A Hohokam ruin is located near this confluence, which is referenced in early Spanish accounts.) 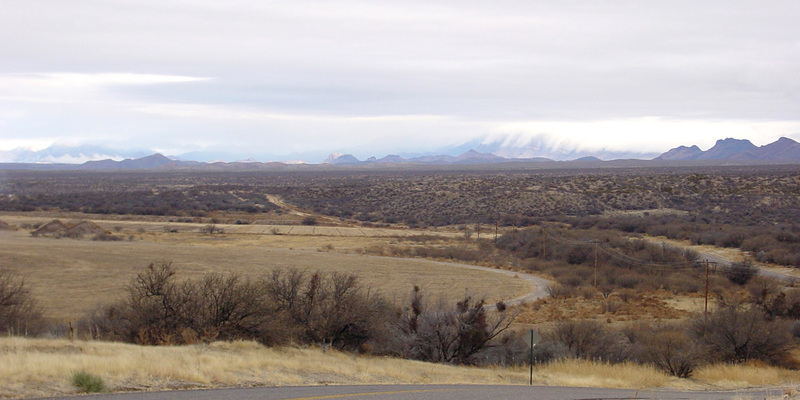 Across the valley, counterpart near-horizontal-appearing Pliocene terraces are visible, with the Little Rincon Mountains above them and a blue-cast Rincon Peak, at 8,482 feet the second highest peak in the Rincon Mountains compex, rising further behind. 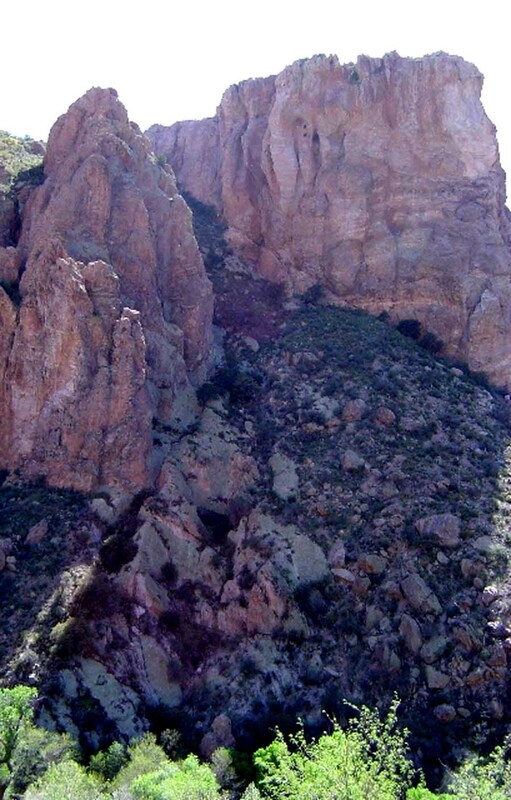 All of these mountains are part of the Catalina-Rincon Metamorphic Core Complex, largest example of this type of geological formation in the southwest. 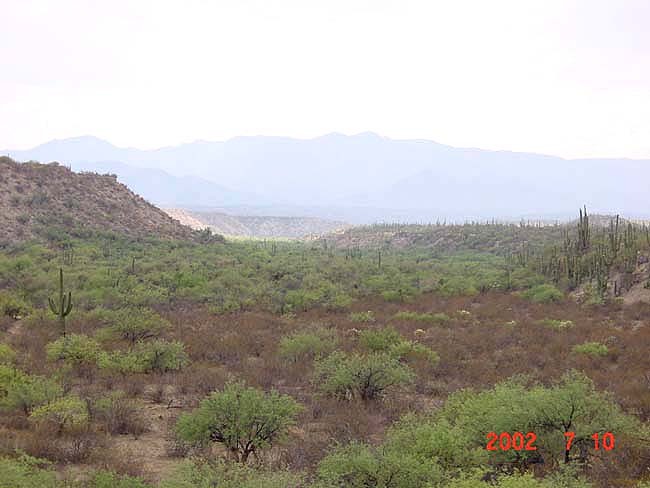 The bajadas on the far side of the river have remained part of the prehistoric Apache Highlands Grasslands. (See also Apache Highlands Ecoregion). Just upstream from and out of view to the left of the Pliocene terrace formation at mid-left, Ash Creek runs into the San Pedro from its source in Happy Valley in the shadow of Rincon Peak. 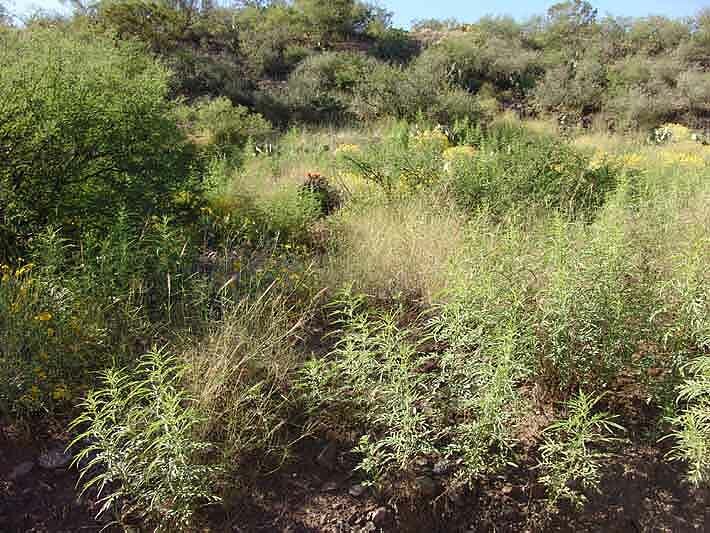 And for an overview of our valley's vegetation, see San Pedro River Valley Flora Today. 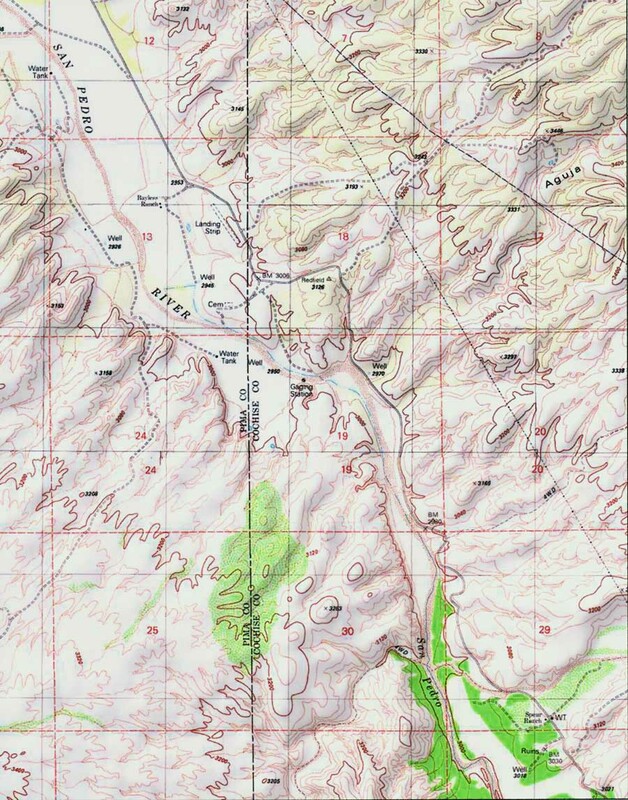 Topo maps we present in our discussions below will illustrate only a few of these corridors, which are however multiple and connect both the Santa Catalina and the Rincon Mountains on the west to both the Galiuro and the Winchester Mountains on the east. Many of these washes contain springs, permanent streams in their upper reaches, including populations of fish, and mountain lions and bears purposefully walk down some of these washes following pools of water on their way to the river and beyond. Population pressures in one area may stimulate species recoveries in another. Any one equipped with a sense of the importance of history to our understanding of the present and future (not to mention the past) will appreciate that along what is now the Cascabel Road (the sole current route running up the east side of the river from Benson to San Manuel) one may see major evidence of previous human efforts to alter the landscape quite drastically. 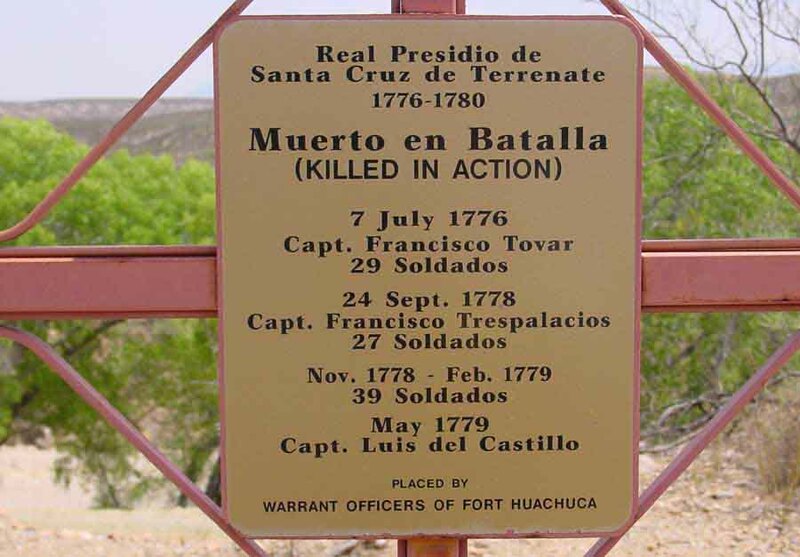 Follow briefly with us enroute toward Cascabel on this road in order to observe this historical evidence. A Previous Effort by the Arizona Department of Transportation, aiming to Build a Very Large Road Here: The Aborted "Grand Roadway"
Since beyond this sign toward the south the land drops away abruptly in a series of deep ravines running nearly perpendicular to the apparent target of the road -- U.S. Highway I-10 some 7 miles to the south -- the prospect of building a road further in that direction would seem very daunting indeed (not to mention that of cutting similar gashes through the various lands further north). One understanding (not at this point confirmed by us) relates that in the late 1970s some members of the ADOT pushed this project into construction in order to provide a better and shorter link between the San Manuel mine and smelter and other mines located along the Mexican border. The project foundered due to conflicts over funding, recognition of the ruinous costs that would be incurred in order to complete it, and "issues of drainage" -- the newly established EPAs requirements rendered the plan untenable. The lower portion of the topo map (at left) still indicates the wishful projected direction of a road extension aimed at I-10 in a straight line toward the south-southeast across what is on the ground an array of deeply cross-cutting, bridge-demanding washes. The expense of completing this project on this southern end alone would have been enormous indeed. We who love Cascabel know that everyone owes the present relative wildness of the Cascabel portion of the San Pedro River Basin to the fact that the project was not completed at that time, since a road of this caliber of "creative destruction", though at the time conceived to be only two-lane, would surely have been thoroughly paved, and Cascabel would by now be a bedroom suburb of Tucson (not to mention drastically transformed as an alien presence from a wildlife point of view). But like Frankenstein, versions of this plan to "pave paradise" apparently refuse to die -- in 2007 ADOT studied the feasibility of a much larger (4-lane or more) highway to bypass Tucson enroute to Phoenix and points further west. Only strong and persistent active popular resistance forestalled this project. 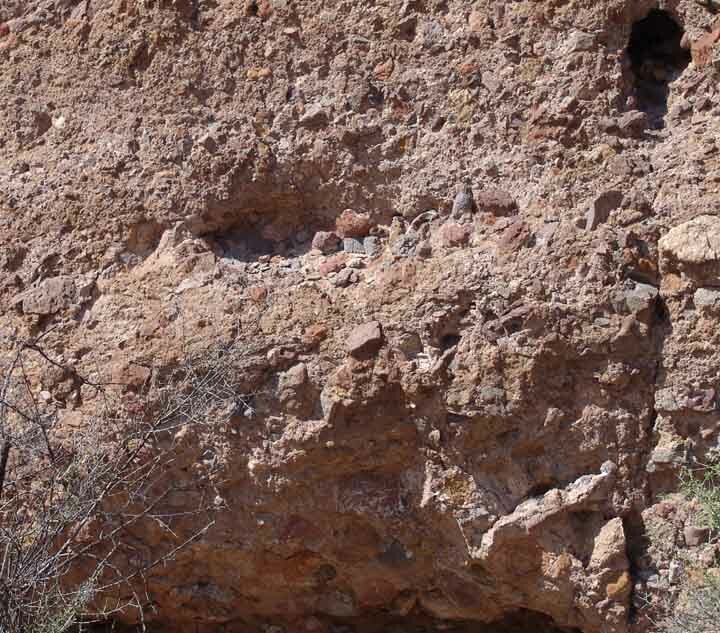 Only by approaching the roadway from beneath, that is from the position of the Tres Alamos Wash which it overruns, can we see the true expense that this construction entailed. Below, massive pillars stand in mid-wash, supporting a very extensive span. Flanking them, the ramps which embrace and constrict the wash.
Below, the south ramp, employing no doubt materials from the Grand Cuts but some other materials as well. Below, the north ramp, whose grounding materials would perhaps largely come from elsewhere. Below, the view of this whole twentieth-century operation seen from the second terrace of the post-Quiburis (<7.5-5.5 Million years ago) wash. The high terrace at horizon view is composed of remains of Quiburis deposition. The first terrace is out of view below to the left, just above the floodplain. The north ramp of this Grand Bridge system merges with the third terrace at mid-right in the image. This downstream constriction of the natural drainage has, over an approximately 30-year period, produced an "inland delta" just upstream by systemically slowing the wash's flushing processes. Aside from the expense of construction, such great side-dams significantly alter wash ecology. Our point here is not that the change to be explored here is necessarily good or bad -- we do not know. But the fact is that the ecological changes were largely unintended, unconsidered, indeed (to the planners and builders) probably for the most part unimagined, and they are without question real. Beyond the Grand Cuts shown above, the road turns north-north-westward as you go downstream and drop down toward the River. 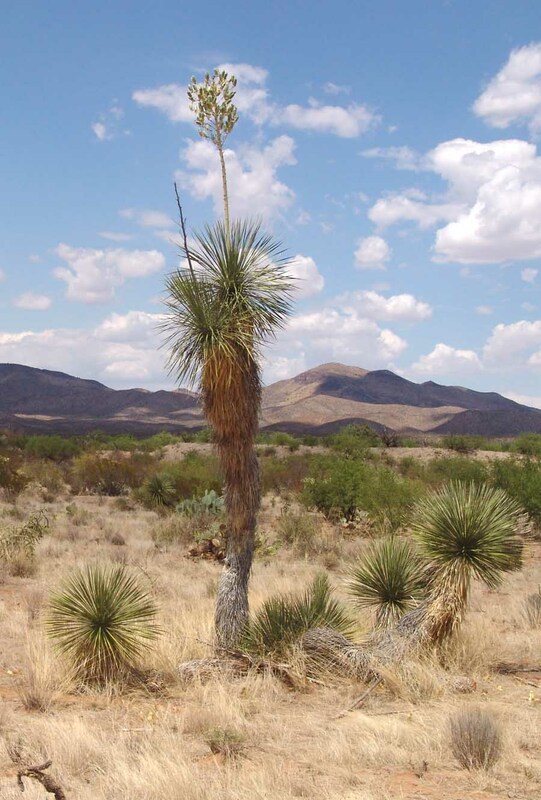 Yucca species and their relatives are important indicators of eological conditions as well as valuable plants in their own right. For more on the subject, see The Agaves and Nolinas. 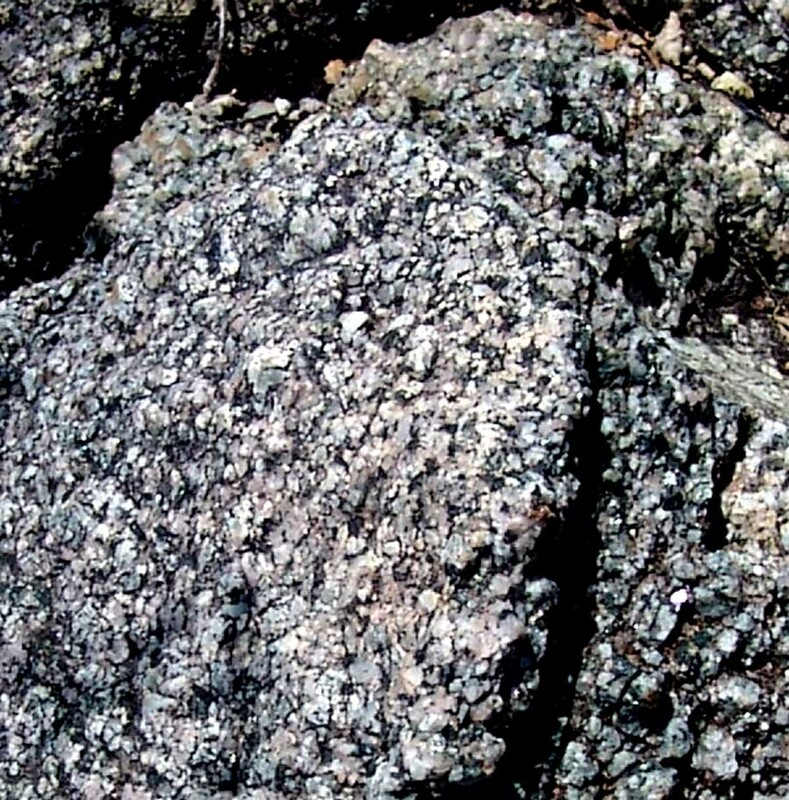 (And for a broader reference guide to the vegetation of the area, see San Pedro Valley Flora: Today; for a comparison in deeper time perspective, see San Pedro Valley Flora: in the Pleistocene. Note also the Desert Grasslands filling the ground in the image at left. In March 2005, the gray hills of the Little Rincons foothills which approach the River at this point, below, were covered with Mexican Spring Poppy blooms. 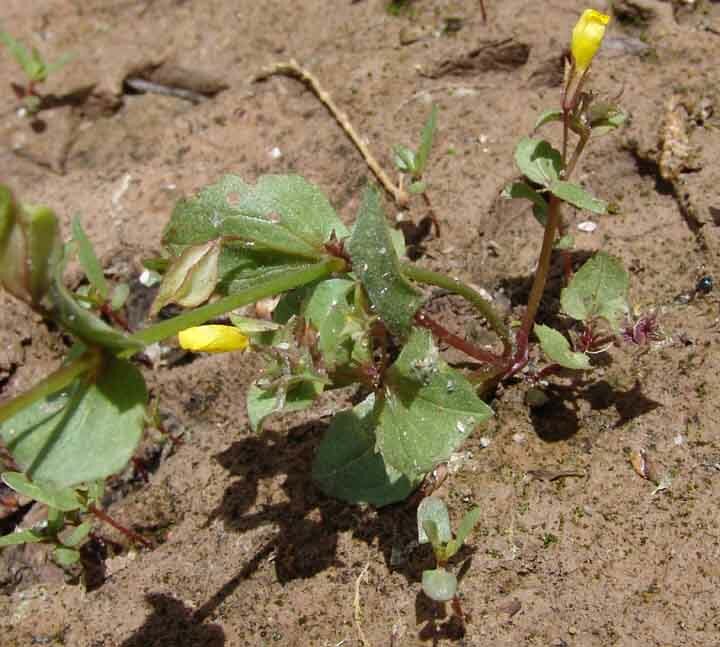 A newcomer to the area may sense the diversity of wildflowers in our area by consulting the following link: Wildflowers. Below, a view across the Benson Narrows looking west. The lip of the Narrows is in the near foreground, Wildhorse Mountain in the distant far right. Below: the visually striking Johnny Lyon Hills rise above the San Pedro east of where it runs through the Narrows. From the Benson Narrows northward, we enter the Redington Sub-area of the Middle San Pedro Watershed. Over a four-mile stretch of the River straddling the Benson Narrows, the riverbed drops about 40 feet, a hydrological change where deep valley fill upstream encounters this bedrock outcrop that forces water to the surface. Early 19th-century explorers reported that below the gorge at this point, the then-perennial stream spread out over the lower floodplain, forming sporadically extensive swamps running all the way past Cascabel and containing beaver dams and large fish. 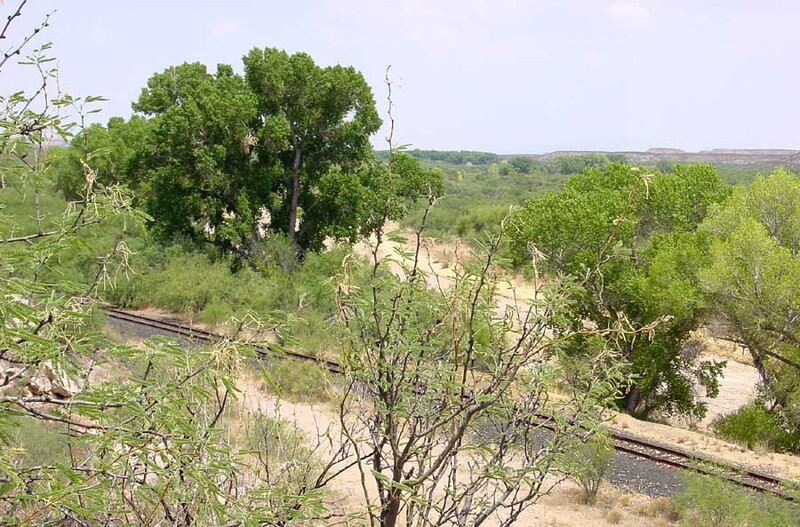 For more on the history of this area's hydrology, see this link on Cienegas. From the Narrows northward to Redington, the aquifer is narrower and thinner than that to the south, and for most of the area it lacks the clay beds found further south that confine the groundwater (though in several locations the flowing river water still rises to the surface). Today, the entire river basin contains long strips of this Cottonwood/Willow riparian gallery forest, which is one of less than 20 such riparian zones in the world. This forest sustains a highly diverse wildlife, including large numbers of migratory birds and a variety of vegetation forms. For a quick take on our birds, see this link: Birds; or see Arthropods; for accounts of terrestrial vertebrates, see for example Mammals, Reptiles/Amphibians; for description of the typical riparian vegetation of this zone, click again on San Pedro Valley Flora Today, and scroll down to (4) Streamways. Below: at the 3-Links Farm, the river becomes a perennial flow for a considerable stretch (cattle have been fenced off the immediate floodplain here for many years). 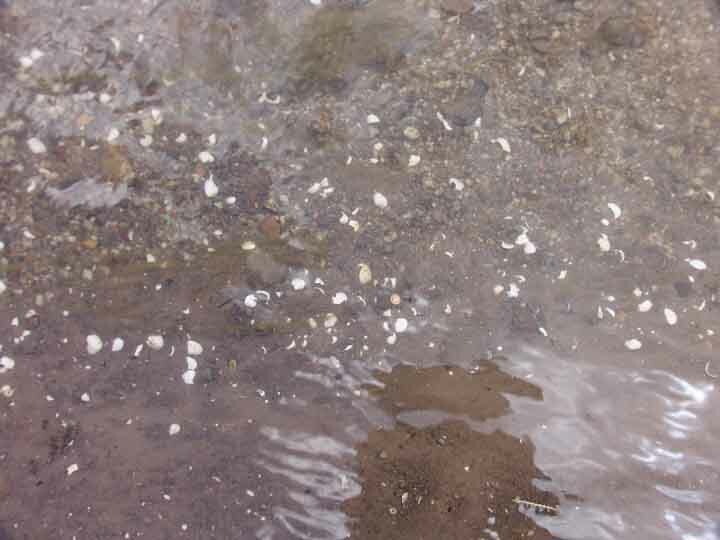 When this picture was taken in February 2003, Dace were spawning in the streambed. Here we're looking upstream. Recently, The Nature Conservancy bought this 3-Links part of the River, and ceased the agricultural pumping of river water (formerly done to grow alfalfa), and over several years the perennial stream has expanded more than a mile in length (though this varies depending on drought intensity). For details on the current condition of our native fishes, see this link: Native Aquatic Species (Gila River Basin AZ & NM). For more information and images showing the biological richness of the River along this 3-links stretch, we present this this side tour, well worth taking, which shows a region as rich in biodiversity as (and in some ways richer than) the federally-designated SPRNCA of the Upper San Pedro Area, discussed briefly elsewhere in this account. The group rested at several points along the river. Note the gallery forest cottonwoods, common throughout the area. This forest, characterized by a Fremont Cottonwood-Goodding Willow association, is unique among North American forests. According to Ralph, about 4 1/2 miles of perennial water now flows through the 3-Links lands, and considerably more may emerge depending on drought conditions. 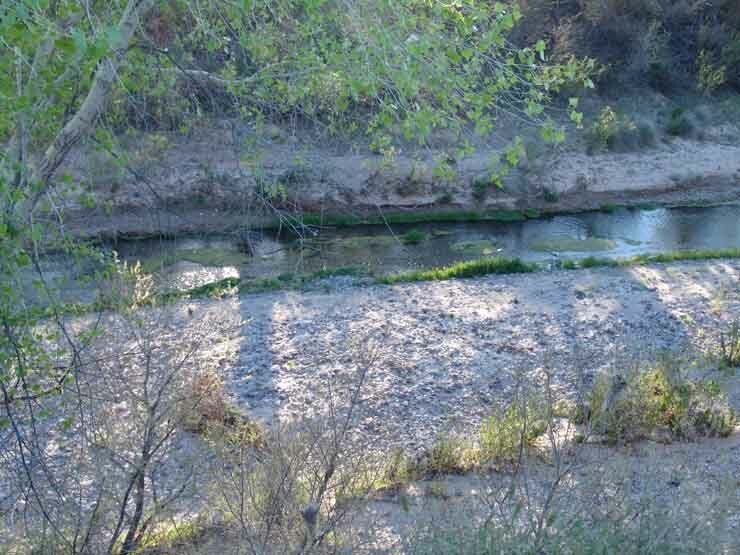 The San Pedro River is the last free-flowing river in the entire desert Southwest. 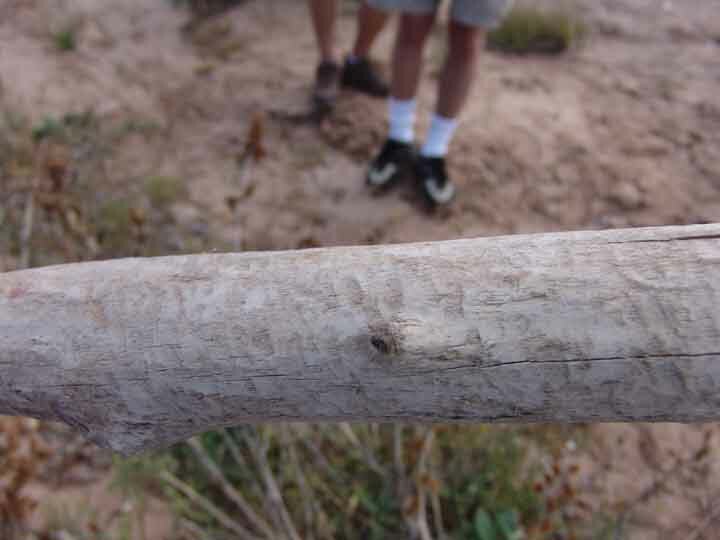 According to Ralph, this beaver moved in from upstream (where a beaver population has been recovering for some time), and was in the area during 2004, but was presumably washed downstream with the seasonal flooding of the River sometime last year. More will probably appear here from time to time (though so long as the river's periodic massive flooding pattern continues, their stays may be temporary). 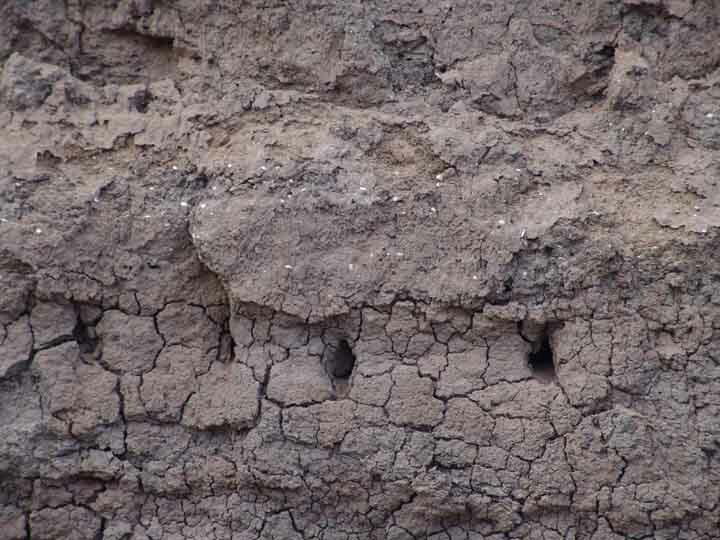 Here the swampy deposits have a depth of fifteen feet or more, and continue right to the topmost layer, indicating that a swamp (or cienega) must have been present here immediately prior to the 1890s entrenchment, and must have existed here for hundreds, perhaps thousands of years before. 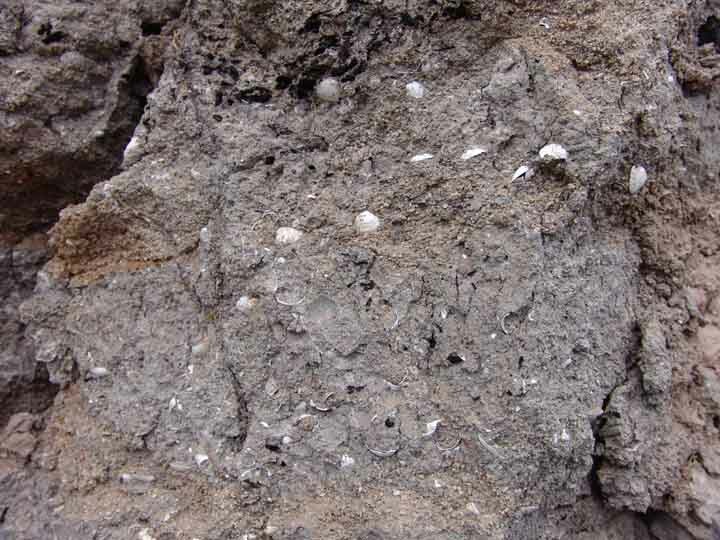 In the images just above, at left the fossils are barely evident from a distance, but closeup a considerable variety of shells may be seen, and at right some have weathered out and now lie under the water in today's streambed, where they will eventually be deposited further downstream in a second sedimentary formation. Members of the Sedge Family (Cyperaceae) resemble grasses and rushes, to which they are remotely related within the Order Poales (monocotyledonous flowering plants). They generally grow in wet locations. 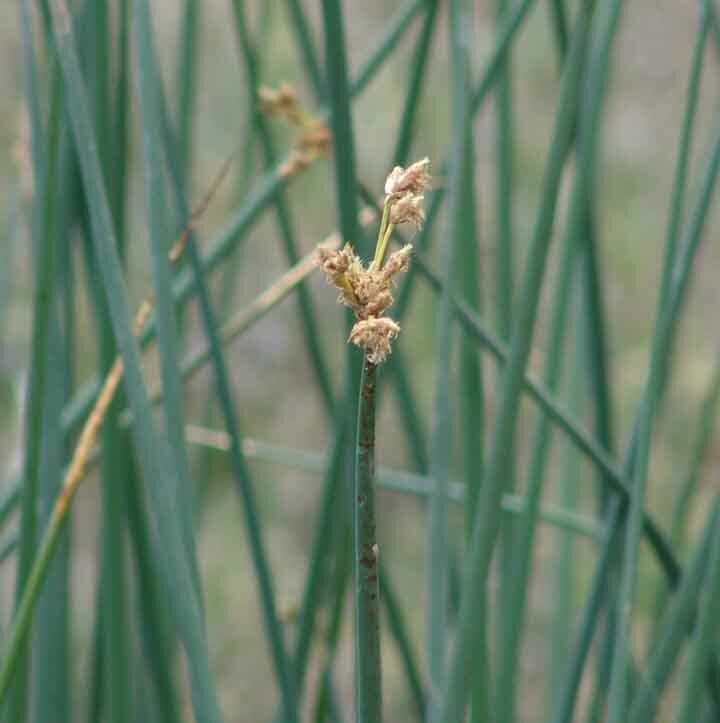 The inconspicuous flowers of the Burr Reed Sedge may be seen in the close-up image above. 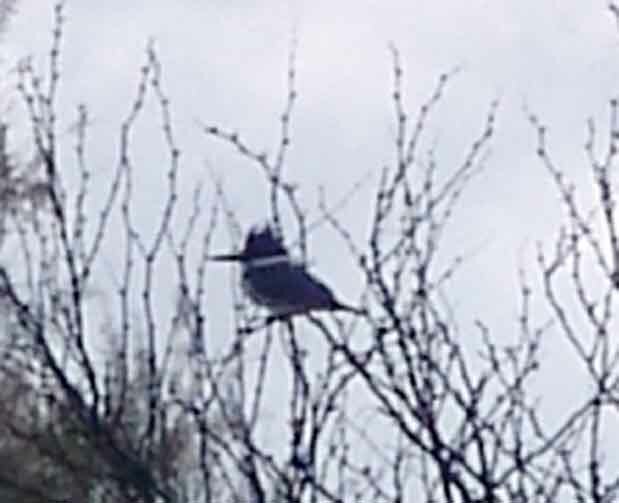 We did not observe fish swimming in the river on this occasion, but they are plentiful and varied. 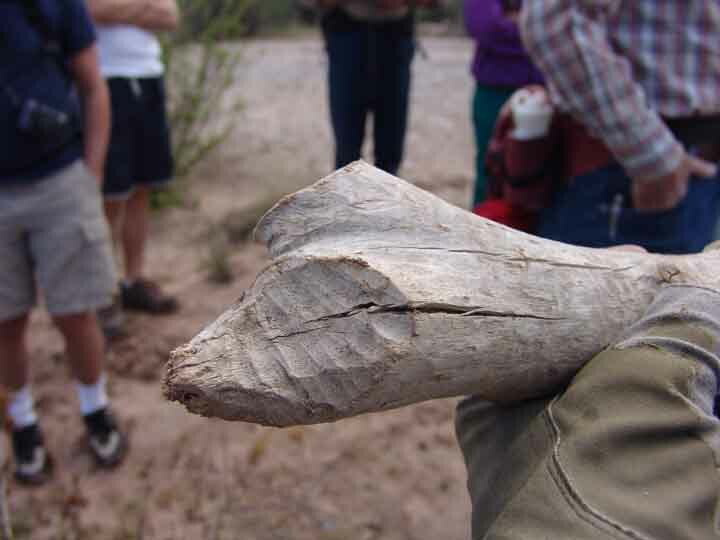 For more details on the fish of one tributary in our area, see Saguaro Juniper Fish. We walked much of the way in the river, especially where the banks are very densely vegetated, as shown below. Octogenarian John Wires, at right, leads the way in this photo. The surfaces of most of these terraces above the river are dominated by a major shrub of our three North American deserts: Creosotebush -- see this link for details on this very important plant [sacred to the O'odham, host to numerous distinctive other plants and animals, a prominent member of most plant communities in the Mohave, Sonoran, and Chihuahuan Deserts). As can be seen on the map above, it has cut a deep and narrow canyon through the Teran-Kelsey Escarpment after draining the extensive Allen Flats (far right), and in flood it can carry very massive loads of rock as well as water. Many washes that cross the Cascabel Road in this area present serious danger to traffic during and after rainstorms. Below, after a storm in late July 2005, Kelsey Wash runs modestly. Proceeding further north, the very broad (and, further upstream, multiply dissected) Teran Wash strikes into the river at Milepost 20. 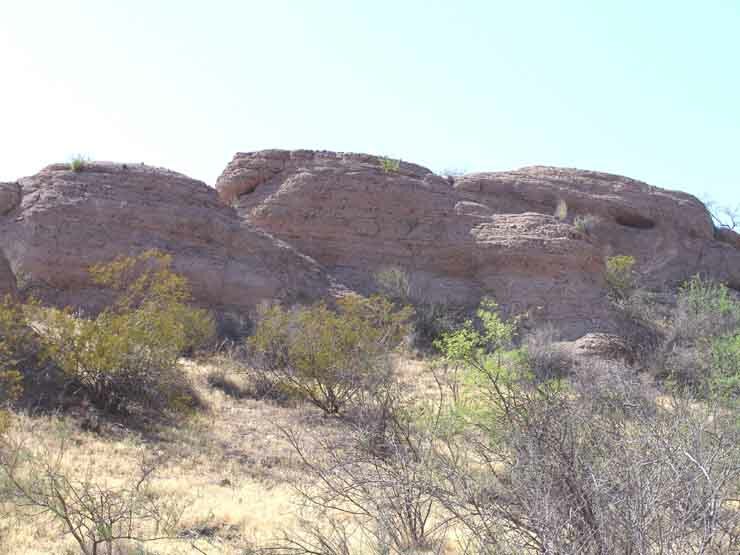 Tthe Teran Wash is a large one: note how the inflowing wash has in earlier times helped cut out the high cliffs evident at the lower-left (southwestern) bank of the San Pedro here (for a photo image of part of this cliff-face, see further below). Long-term resident Barbara Clark has old maps of the Teran Wash confluence from early in the 20th century, showing that Teran Wash apparently entered the River at the grade of the bosque at that time, so -- as can be seen direcly below -- this marks a very considerable recent change, a drop of about 40 feet from near the current roadway to the floodplain. This image of the Teran Wash road crossing below shows Teran Wash in very modest flow in late July 2005, with some of the vehicles waiting for the flood to subside while a higher-centered vehicle begins a run across. (The problem in this instance was not rate of flow but the deep undercutting of the embankment in the foreground; much of the flow is out of sight because the embankment has been sharply cut on this side.) The depth of the wash below the main grade of the road here is on the order of 20 feet. Note the power pole visible at mid-left top in the above photo. Across Cascabel Road from this spot is a single-lane road turnoff leading to the Oasis Bird Sanctuary, the Deacon's Cathedral, the La Margarita community meeting center, and the Cascabel Clayworks. 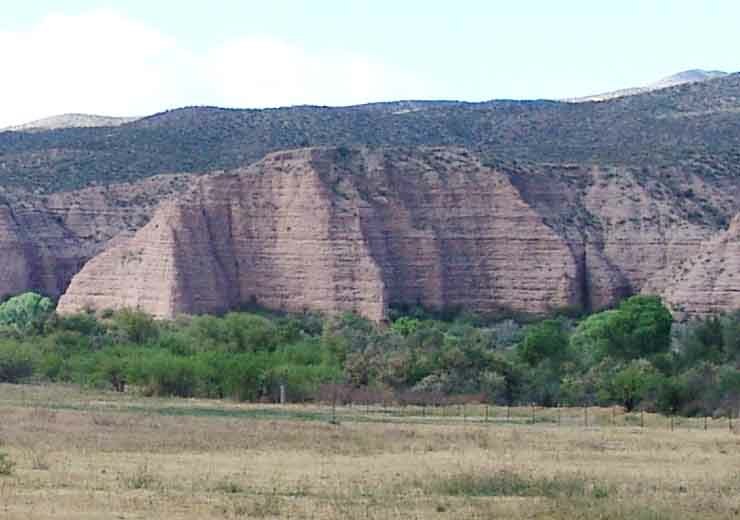 Like the other portions of the West Range of the Galiuro Mountains bounding the San Pedro River in this area, the Teran-Kelsey Escarpment shows strong block-fault tilting away from the River Valley. 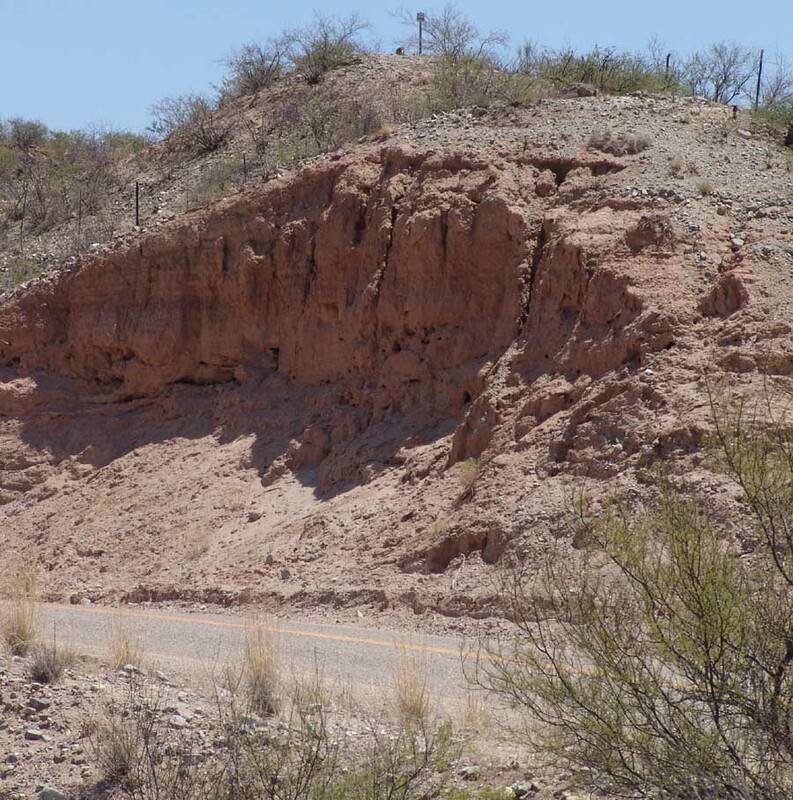 For more detailed views of this piece of the Galiuros, see this link: Teran-Kelsey Escarpment, and for geological context see Basin-Range Faulting. While downcutting during the twentieth century has lowered the water table at this point, some 6 miles further downstream perennial stream reappears in a number of places, and there the riverbed is not so channelized. Entrenchment is a prominent but not continuous feature of the River in our area. 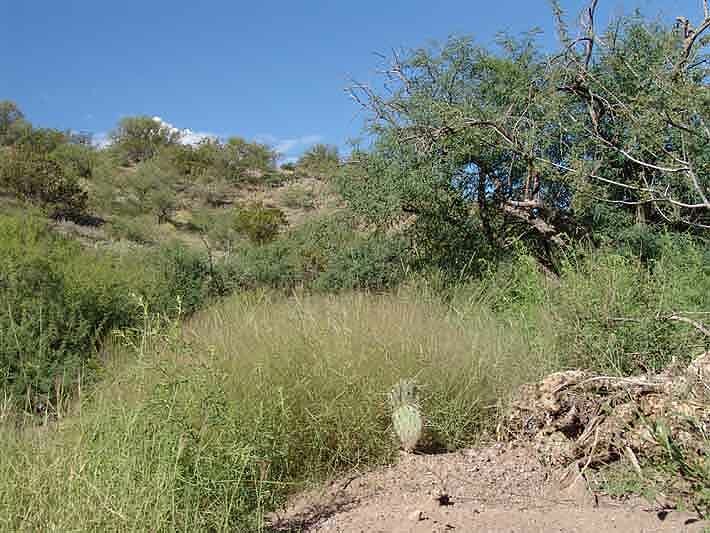 For a wide-ranging discussion of changes in the vegetation of this area, see Changing Sonoran Desert Vegetation. Sierra Blanca Canyon (shown flowing to the river from far upper-right in the map just above) is a large and dissecting corridor throughout its length. See the side-page below to get some sense of its biodiversity and richness. We are here viewing the nexus of the Cascabel-Paige Wildlife Corridor, running from the lower flanks of the Galiuro Mountains (where the photographer stands, i.e. the lower flanks of Soza Mesa) to the Rincon Mounts at far mid-left . In the map below, Hot Springs Canyon enters this central point from far-upper right along the high terrace marked near the roadway by the indicated "landing strip". 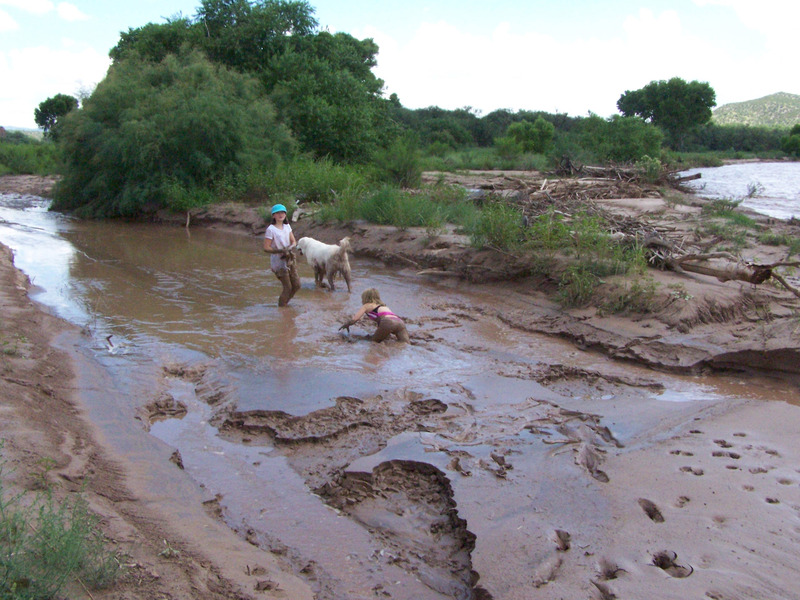 Below, in August 2010 Confluence-dweller Sue Newman took this picture of two children of a friend playing (with Sue's mighty dog Sammy) in the mud of Hot Springs Canyon Wash (at left) where it merges with the San Pedro River (at far right, the latter still running strong after Monsoon rains). (Click on the image to enlarge it). Hot Springs Canyon mud is apparently great fun to smear all over one's body (but the warning we cited above about flash-flooding should be borne in mind throughout the Monsoon season). In the map above, Paige Canyon enters this constriction at bottom-center, hauling its water resources down from the perennial springs of the Happy Valley Basin in the Rincon and Little Rincon watershed. Roble Canyon joins the cluster running out of the Little Rincons from lower left, and it too has perennial springs in its upper reaches. Pool Wash, running from the upper right corner to its confluence with the San Pedro just east of the Cascabel icon, is also a significant wildlife corridor, and the Sierra Blanca Canyon Wash, shown here at the right, also contains perennial springs. These corridors together form dynamic intersections of wildlife activity -- we have already emphasized the birds, and speaking personally we regularly observe bears, deer, javelina, coatimundis, and numerous other mammals crossing the webbed fingers of this crossroads (not to mention other non-mammalian forms like the sometimes seemingly ubiquitous Gila Monster, who definitely finds Cascabel to be a paradise). 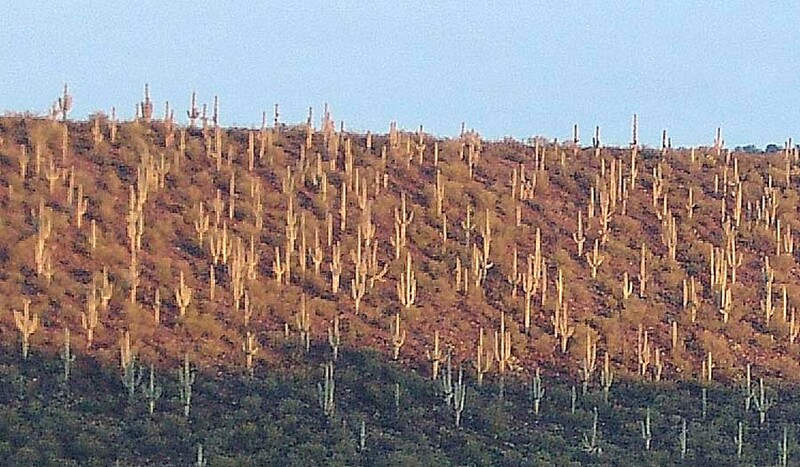 All of the obviously upright, sunrise-highlighted plants evident here on this slope are Saguaro Cacti, prime real actors among the distinctive plants of the Sonoran Desert. See The Arizona Uplands on the most characteristic features of our immediate area, and see Saguaros for details on the significance of this dominant plant in this ecosystem. 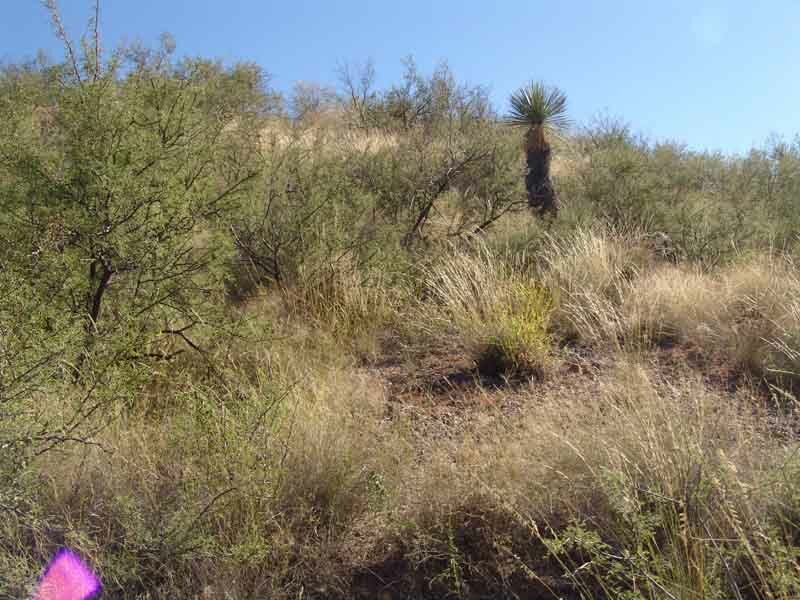 The pioneering plant ecologist Forrest Shreve called our Arizona Uplands a "stem succulent desert", referring to the prominent role played in it by Saguaro, cholla, and other cacti. For more details on these plants, see Cacti. Below, a view of part of the above hillside taken in February 2008. Note the venerable age of many of these Saguaros. Somewhat surprisingly, immediately across Hot Springs Canyon toward the south, the frequency of these trees declines quite sharply, and they nearly disappear further south beyond Kelsey Canyon. (For a more extended [if somewhat out-of-date] discussion of Ecoregions, see Ecoregions in Our Area.) Thus the Cascabel locale has another quality of distinctiveness: as a multi-transitional zone, it intermingles life-forms from all three (or more) zones, and thus possesses an intensified diversity. Again, see also San Pedro Valley Flora Today. Even the lesser ridge/ravine dendrites you see here are not small. Cascabel as defined here (see the purple dot on the satellite photo) is the central point of a multi-corridor system of bio-communication. To repeat some references regarding ecodiversity here: For a quick take on our birds, see this link: Birds; or see Arthropods; for accounts of terrestrial vertebrates, see for example Mammals, or Reptiles/Amphibians; for description of the typical vegetation forms for this locale, click on San Pedro Valley Flora Today. Its peaks rise high above the surrounding terrain (and have done so for a very long time, once much higher), and the fronts of the range are fairly close to the river at this point. Today, this intensifies runoff when monsoonal rains occur, and very massive flooding can result at many locations along this bottleneck corridor of the river. Since the southeastern slopes of the Galiuros drain ultimately into Hot Springs Canyon, and contain permanent streams, the " wildlife-corridor" significance of this striking "sky-island" lies as much on its far-eastern side as the one more visible to us here. 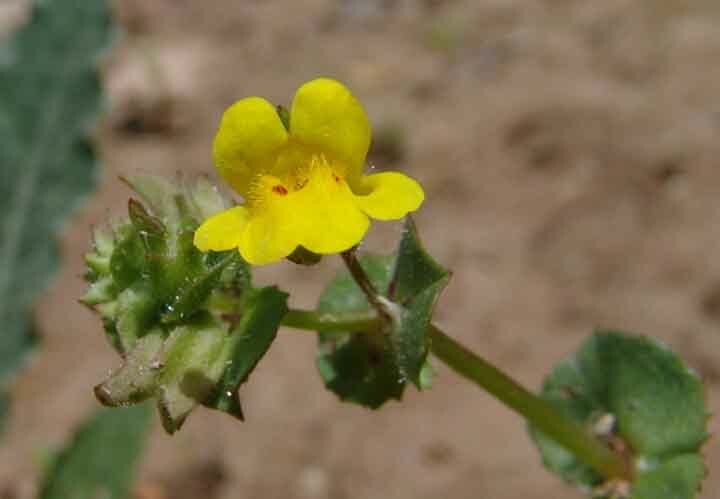 See Galiuro Mountains for more details (both visual-geographic and ecological) on this very long and very important array of habitats: the wildest mountain range in southeastern Arizona. Think about an Interstate Freeway-prospect here, as we have had to contemplate the prospect in the recent past: the bridge would have to extend well beyond the position of the photographer, far beyond and above the height of the vehicle seen waiting on the far side, and at three-to-four times the current roadway width. Such a Highway would make unliveable Elna Otter's house and home (where Sunday Quaker Meetings are often held; the place is off to the left in the trees beyond the far parked vehicle), and we've not even mentioned residents on the downstream side of the wash at this point. 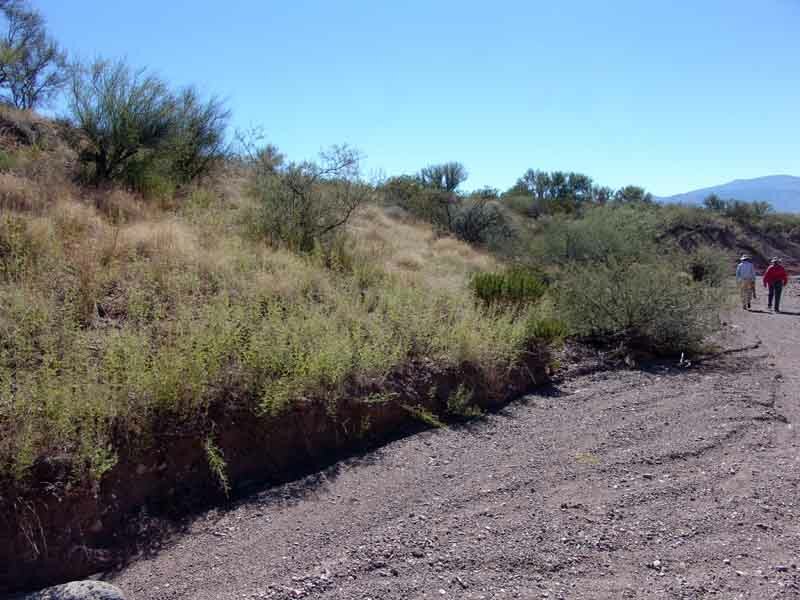 For example, there are small but significant archaeological ruins, dwelling places of the O'0dham people of southern Arizona (whose ancestors lived here from pre-Columbian times until 1762) located near the present roadway. These ruins would surely be obliterated by any further Highway construction along this road. In terms of "Central-place" theory, Cascabel Central meets every criterion of indispensibility from a desert ecosystem point of view, a fixed-location, global-species-endangered eco-spider. Hot Springs Canyon is an unpredictable, dynamic -- and on occasion quite dangerous -- water-and-debris carrier, which sometimes displays highly destructive power. On the western side of the constriction, Paige Canyon can (and just a few years back, did) dump a temporary dike across the entire river floodplain, causing the San Pedro River to back up for days until rising floodwaters cut through the dike. 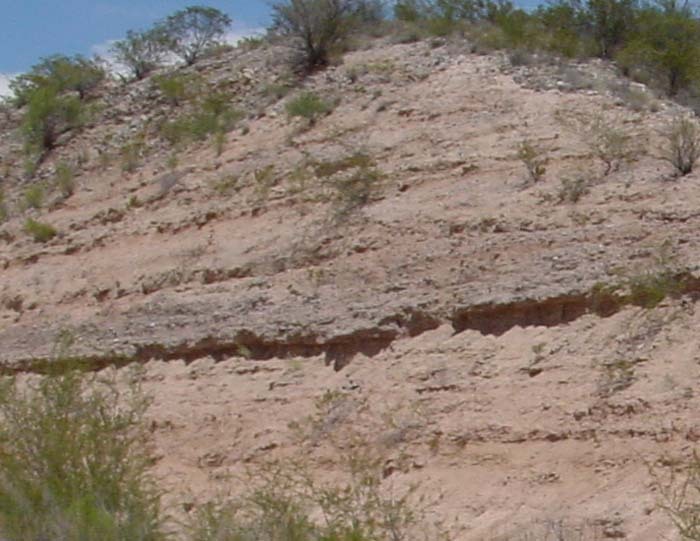 Soza Mesa is a greatly elongated Pliocene terrace (7.5-5 Million years old, see Geology: more recent patterns), built by long-sustained erosion of the formerly much-higher Galiuro Mountains. Note how it forms "fingers" of descending slopes that fall down to the river. On this map it perhaps appears a somewhat bland structure, and it is not visually much evident from the roadway below, but in fact the levels shown here give little hint of its size. Its elevation at the top, where it forms a very extensive tableland, stands at 4200 feet at its highest northeast elevation near Wildcat Peak,and it remains almost tabletop-level for miles until reaching its western finger-edges at 4000 feet, then declines at somewhere near the angle of repose until it reaches the river at around 3000 feet elevation. The amount of eroding materials that descend to river (and roadway) during flood occasions can be (and often has been) huge. This has very daunting implications for roadway construction here. From the standpoint of the bottoms of Soza Mesa Washes, each wash is relatively wide and sandy, and this holds true at the upper reaches as well as the lower ones. Below, we are looking upstream from a position near the Western bottom of the Soza Mesa fingers (not very far from the San Pedro River). At this point, two large washes, running out of the upper-left and upper-central part of the photo, converge toward the right, meeting at the lower right of the photo, with a low (but very long) ridge dividing them upstream (marked with a small roadway running up it from below). These are very wide washes indeed. 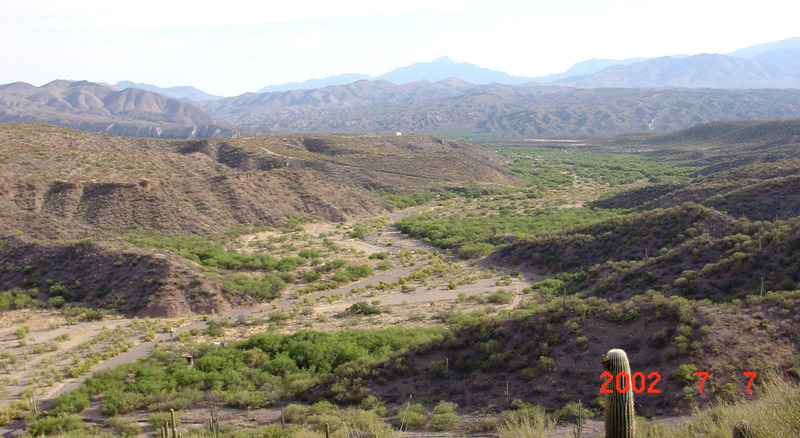 Below, a view from a more northern finger, the Jack Murphy Wash, which is huge even at this very substantial distance from the San Pedro River confluence (the very light green strip barely visible in the center of the upper-left quadrant of the photo). 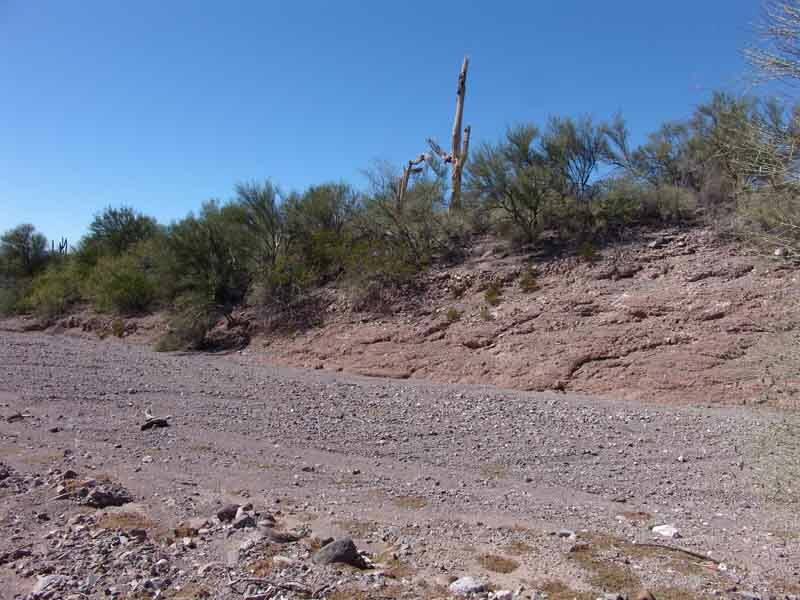 This is one of the washes whose runoff devasted parts of Cascabel north of Hot Springs Canyon during the July 2003 floods. We photographed here in February 2004 while repairing fences. Below, a smaller wash also at a long distance from the San Pedro, running down from the Mesa toward the viewer, then curving sharply to the right at the bottom of the photo. Even here the wash is wide and sandy. 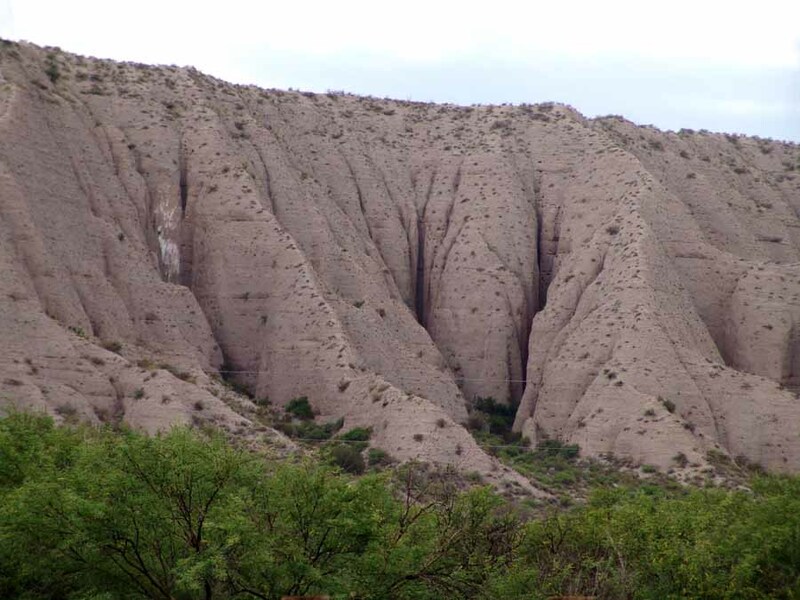 Note that at right-center its flow has exposed bedrock of the Quiburis Formation, which is present all along these mesa fingers. Note also the large old Saguaro at middle-left, standing right in the middle of the wash in February 2004. This contrast in vegetation is consistent throughout these east-west drainages, though the differences are more striking following good monsoon rains than they are after drought. 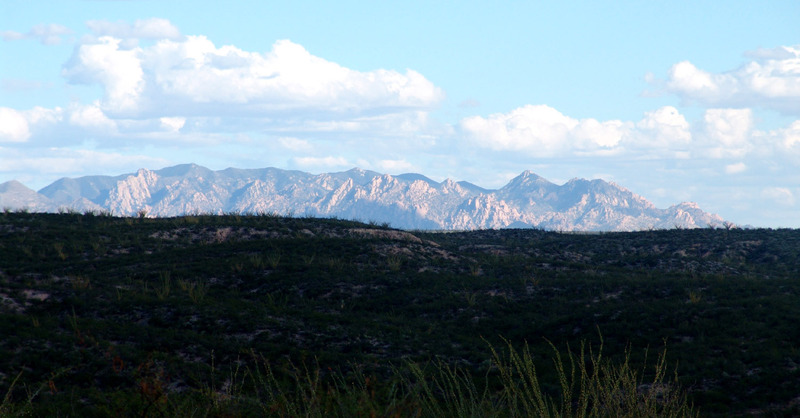 Soza Mesa is named after the descendants of a Spanish soldier whose family moved from Tubac to Tucson in the late 18th Century, some of whom proceded into the San Pedro River Valley in the 19th Century. There they established an extensive domain and a quite prominent dynasty. For more information, see Edward Soza. On the other hand, should routes follow the adjoining uplands, a series of rugged cross-cutting washes (click on the map image below for a wider-angle view) would require another extensive series of bridges along this stretch. From the vantage point above, the effects of the 1983 and 1991 floods on the river floodplain can be seen. Beyond the first terrace above the floodplain (which is visible in the near foreground of each image), the floodplain was almost entirely scoured of vegetation here, including the whole expanse from left to right upstream from the bottleneck of the Narrows. On this high and dry terrace, the dominant vegetation (aside from the grasses) all the way to the terrace's cliff edge is Jumping Cholla. For more details, see Cacti and/or scroll down to Cholla. At Redington (see map below), two large wash corridors meet the San Pedro to produce a wildlife crossroads -- Buehman Canyon running from the Catalinas and Redfield Canyon from the Galiluros. These both form deep canyons in their higher reaches and have perennial waters upstream. 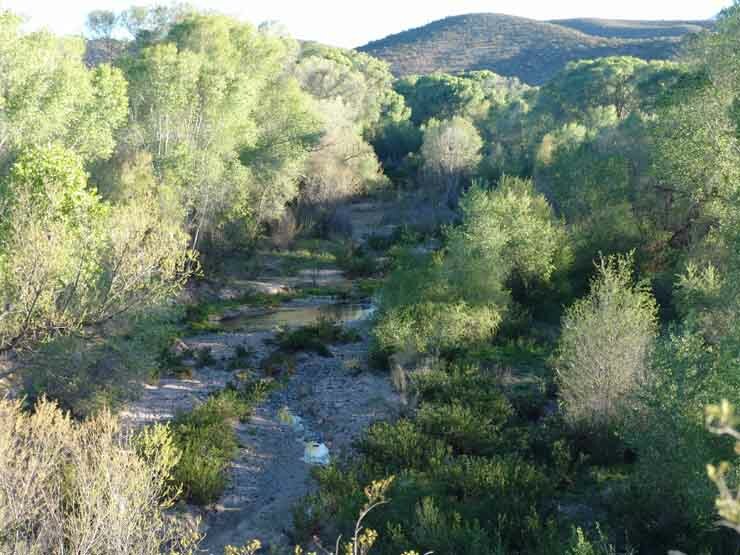 The Bingham Cienega Nature Preserve, located in this significant wildlife corridor in upstream portions of Buehmann Canyon, contains a spring-fed marsh which supports distinctive riparian plant communities and serves as an important oasis for migratory birds. Redfield Canyon is a deep, narrow red-walled vertical gash through Galiuro Volcanics rocks. Perennial waters may be found in its side-canyons, and the 6,600-acre Redfield Canyon Wilderness is centered in the area where the Canyon makes its westward bend descending from the high Galiuros further north. Redfield Canyon is a geological gash of stunning beauty. Red Galiuro volcanics are on display with a stark vividness probably not seen elsewhere. Aerial photography of the Redington corridors (below) shows both similarities to the Cascabel Core (the multiple long-legs spiralling in-and-out) but also differences (the broader, more open floodplain and the lesser depth of dendritic wash-cutting running in from the uplands). 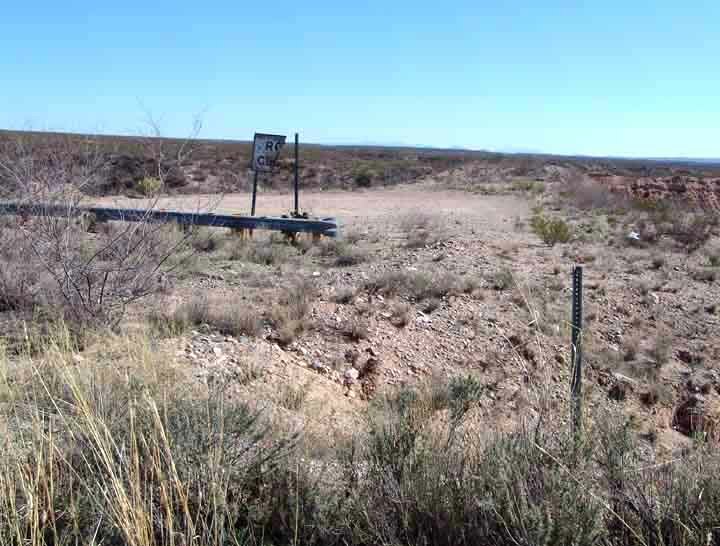 There is quite a lot of private land in the Redington corridor, and land as comparatively open and flat as this would be a tempting location for an off-ramp connecting truckers to rest stops, gasoline stations, cafes, etc., and this would stimulate a township development. and this view below shows the remarkably long earthen ramp built to accommodate this northern end of the projected "Grand Roadway", a structure which obviously alters the drainage patterns here. 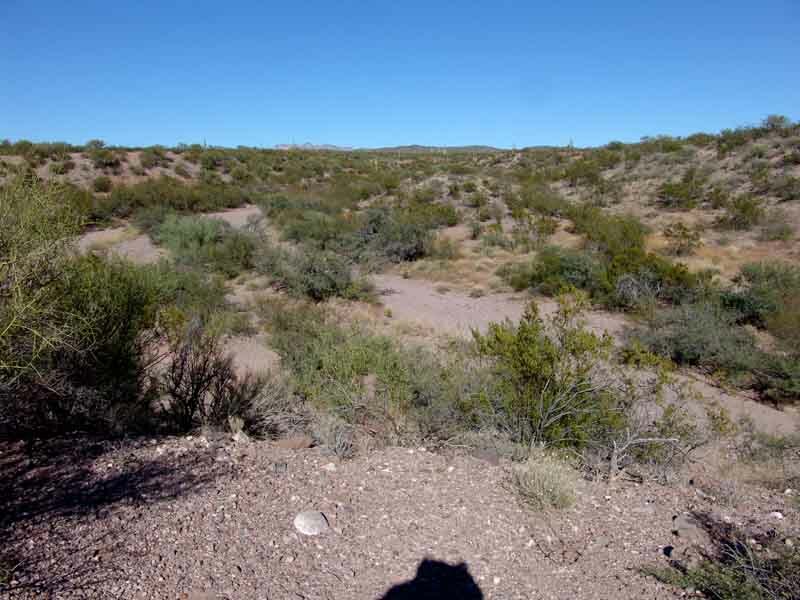 The Redington Pass Road is now a little-traveled if scenically unforgettable dirt-road linking this corridor crossroads with the Tanque Verde Road at the western edge of the Rincon Mountains in the eastern outskirts of Tucson. 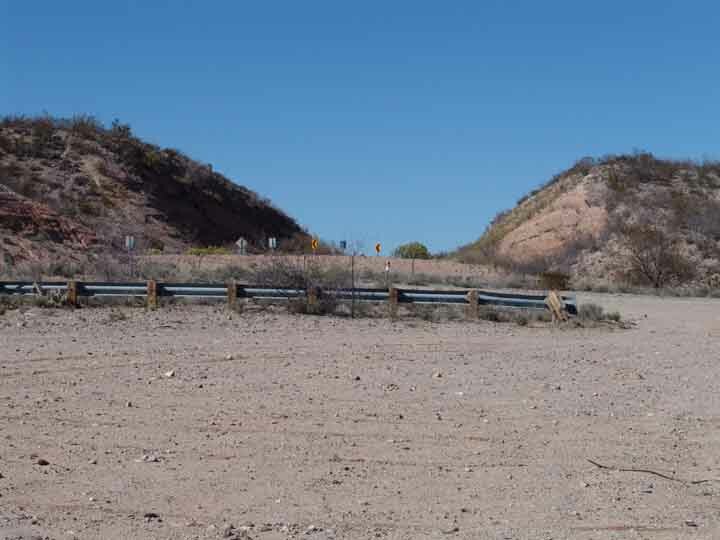 If a major Interstate Highway were to pass through Redington, strong pressure would no doubt arise to provide that off-ramp, and then to pave this rural dirt road (with major consequences for the distinctive biome to be found here.) This particular corridor, we should remember, runs between two Sky-Islands on each side: the Rincons and the Santa Catalinas. and at present it's a bridge for just about all forms of wildlife that may want to pass from one to the other. Converting that into a barrier would be a sad side-story to the larger consequence of making the San Pedro River Valley a barrier between these two Sky-Islands and their longer partner to east, the Galiuros. This corridor links important natural wildlife corridors, one traversing a Nature Preserve and the other extending into imposing federally-designated Wilderness. At this point the valley widens sufficiently that building a larger roadway would probably not be quite so expensive as (and perhaps slightly less ecologically damaging than) would obtain in the corridors a short distance upstream, but the very fact that Redington has more flat (much of it private) land means that an off-ramp nexus would likely be designated here, followed by urbanization. 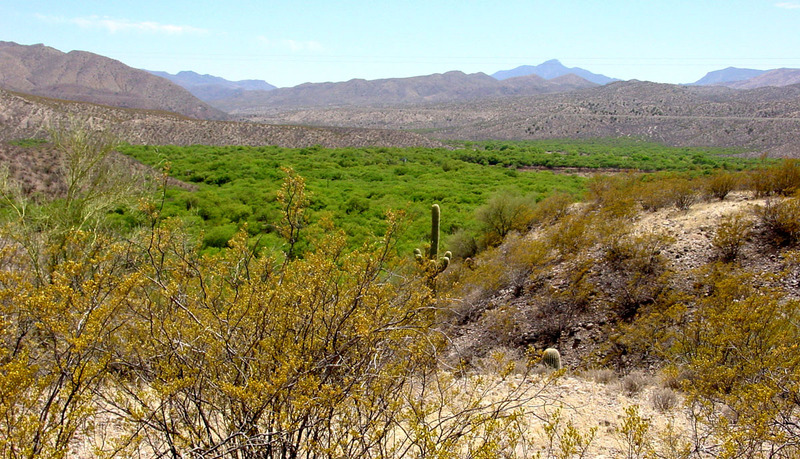 The now-primitive linking uplands of Redington Pass would soon be paved, and the vital ecosystem once symbolized by the Bellotta Ranch would be ruined. This wash would require very massive bridging to build a large highway through here, and it is only one of a series of paralleling Mount-Lemmon-draining washes here, including Stratton Wash, Catalina Wash, and Peppersauce Wash.
On the map below, see Alder Wash running down from the Catalina Mountains. Directly across from it lies a much deeper wash, in Kielberg Canyon, a remote drainage (very difficult to traverse) which drops to the River from the closer slopes of the Galiuros. Together the two washes form a continuous wildlife corridor connecting the Catalinas and the northern Galiuros. At this point we have come very close to the tailings ponds of the San Manuel Mining operation. As you can see from the preceding presentation, the San Pedro Valley is not only special to us, but to the people of the state and the nation. As such, many government agencies, at the city, county, state, and federal level, have invested heavily in maintaining the ecological integrity of the valley. The proposed bypass would have heavily damaged the fruits of these efforts and subsequent associated developments would have destroyed them. In addition, -- and this is a major point we have not previously made here -- some of the investments in conservation have been made as part of formal mitigation arrangements to compensate for the loss of riparian habitat associated with water developments in other parts of the state. The proposed bypass would have contributed to hydrologic dysfunction in the watershed, and associated developments of that kind would lead to the depletion of the aquifer that feeds the San Pedro. The proposed I-10 bypass, if built, would have nullified the benefits of the mitigation purchases by destroying the context in which they were made. The result would be a cascade of complications statewide. Globally, the Arizona Department of Transportation cannot ignore that well within the lifetime of the proposed bypass, fossil fuel shortages will be chronic and the price of fuel will be high. The EPA has declared that C02 can be regulated as a pollutant and that consequences of globally warming are already being felt and will accelerate. This is the context in which the proposal is being made. To say no to the I-10 bypass is to say no to the fossil-fuel dependent, global warming policies of the Twentieth Century, and to say yes to planning for an alternative, more sustainable Twenty-first Century. The ADOT I10 Bypass study was far too narrowly conceived. We need to look at how we in Arizona want to live in a future of limited oil and global warming and to discover what infra-structure best fits this future.